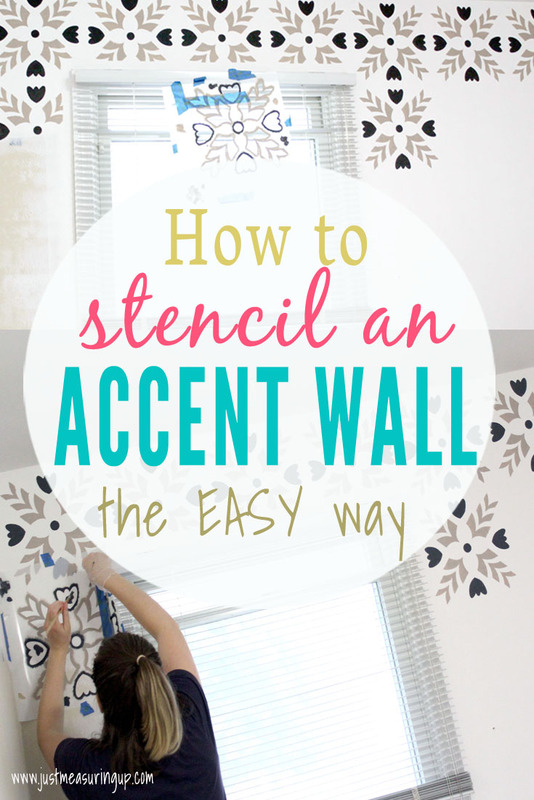 How to Stencil an Accent Wall Post Preview: You will find out how to paint a stenciled accent wall, along with stenciling tips and tricks. This post is sponsored by Stencil Revolution. All opinions are entirely my own. Everyone has a spot in their house that drives them crazy, am I right!? For me, it was our mudroom. It was boring, barely functional, and beyond a mess. 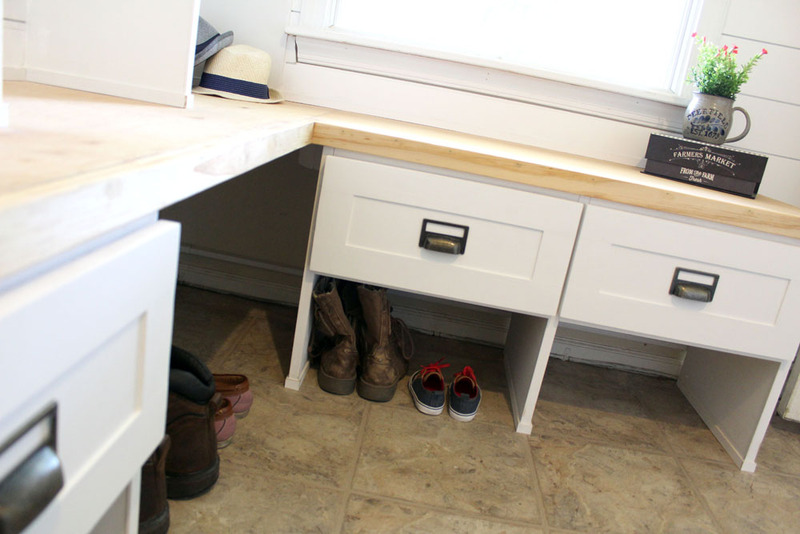 So, we embarked on a mudroom makeover and starting building an entryway bench with locker cubbies. In the meantime, I wanted to add a little character to the walls. 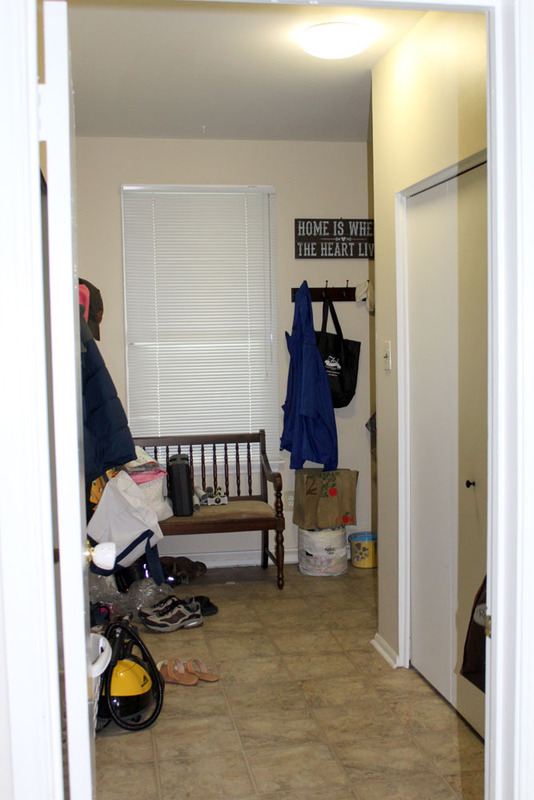 With its beige walls and grayish tiled floors, the mudroom room was just so plain. So, I had a plan to DIY my own “wallpaper” aka stencil an accent wall. Can I just say that stencils are amazing?! 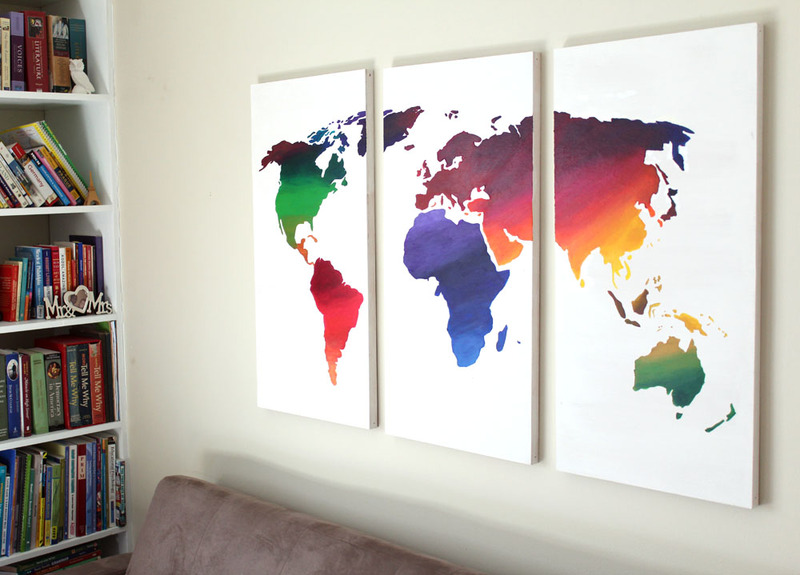 I’ve used stencils before on a world map wall art project, but never on a wall. I couldn’t get over how much the stencil completely changed the look of the room. The previously boring space became completely modernized with the stenciled accent wall. With wall stencils, you get to choose your own colors, rather than be stuck with premade wallpaper. 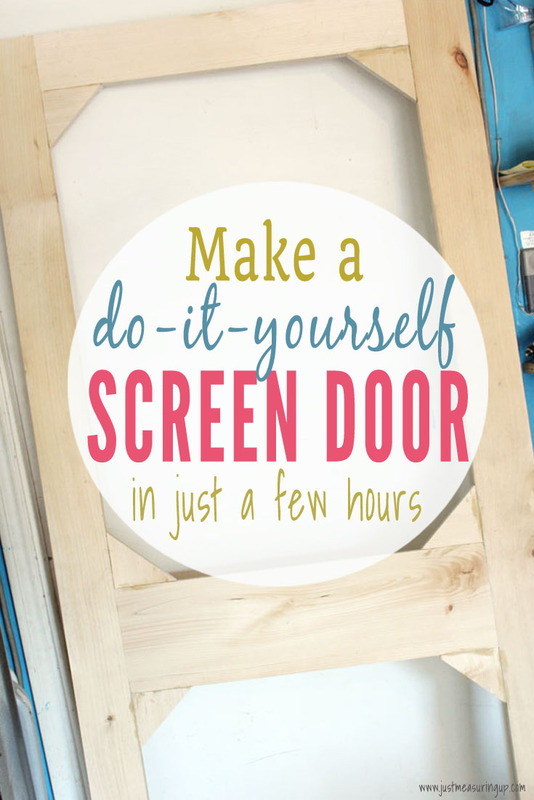 And, you can save money by doing the work yourself – perfect for DIYing on a tight budget. 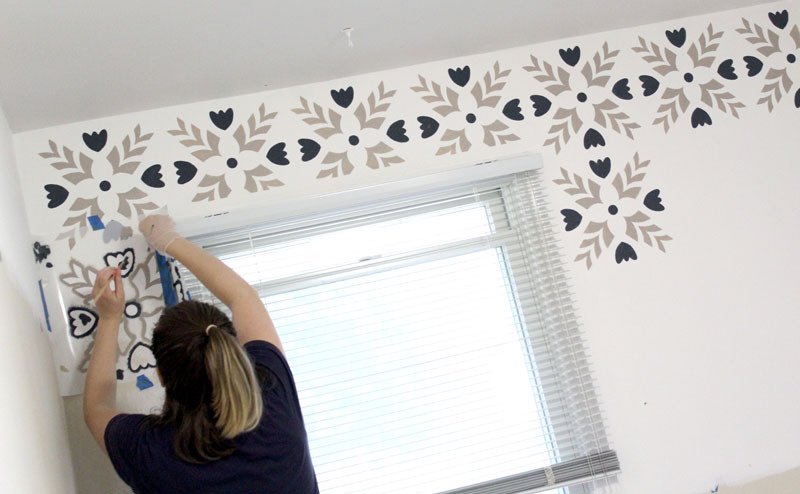 If you’re thinking about stenciling a focal wall in your home, it’s super easy – it’s definitely a DIY project that anyone can do. 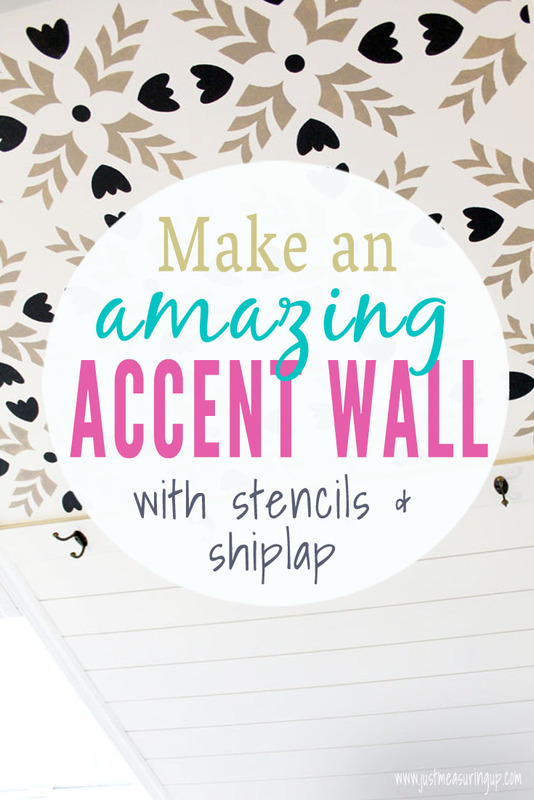 Today, I’m sharing all my tips and tricks for how to paint a stencil on an accent wall. First, I’m going to take you back a minute and show you a crazy before and after. 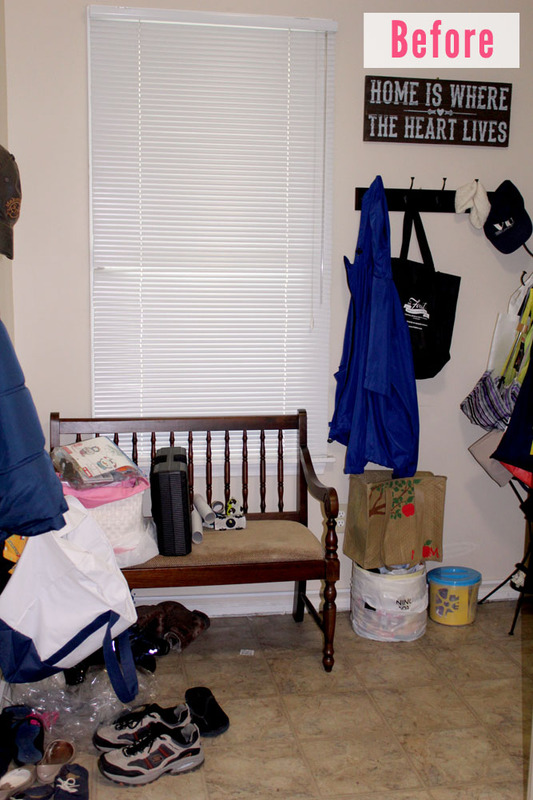 It’s a little embarrassing, but seriously, this is what the room looked like prior to the mudroom makeover. 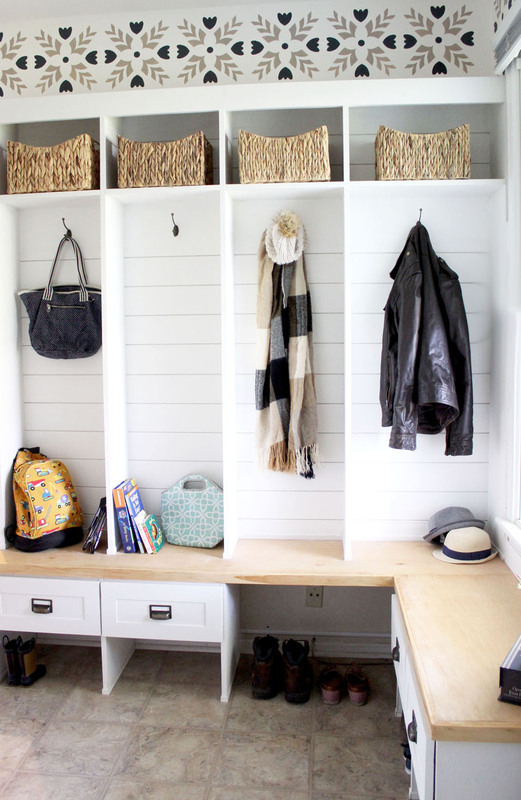 And here is what the mudroom looks like after its makeover. And here’s another angle – I continued the stencil across the adjacent wall too. So let’s get started! To stencil an accent wall, you’ll need a good chunk of time, and the following items. 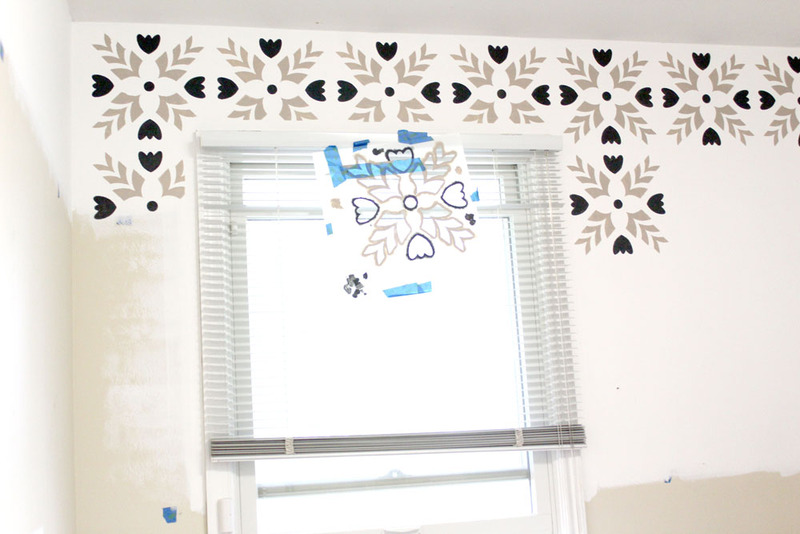 Check out our wall stenciling video to see me in action, stenciling the wall. First, you’ll want to choose your stencil. 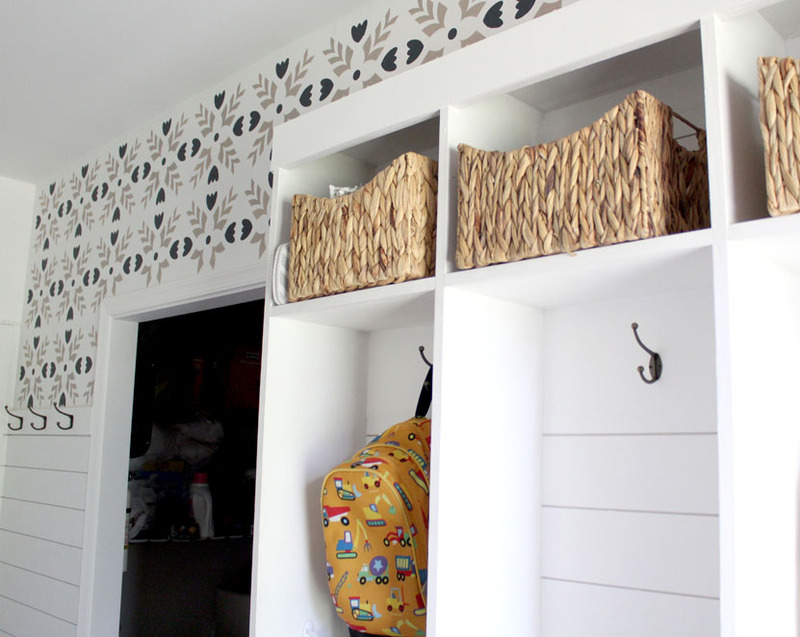 Stencils are awesome because you can create a wallpaper effect for a really inexpensive price. We love the stencils from Stencil Revolution – you’ll definitely be oogling over their new tile line. The stencil we used is the Freya stencil and it’s part of their new line. We loved the colors they used with the stencil, so we mimicked those. 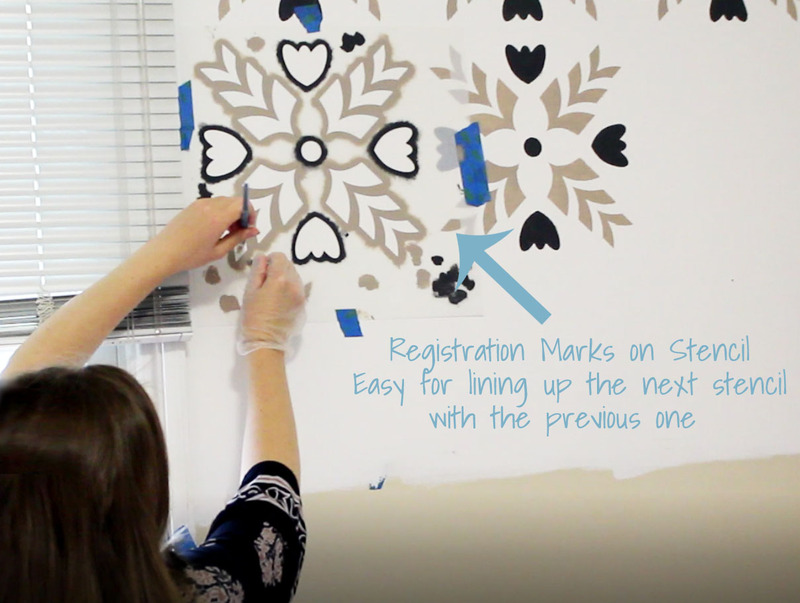 These stencils are especially easy to work with because they have registration marks, where you can easily line up each stencil with the one before. Because of these registration marks, you can get by without needing a ruler or a level. After you have chosen your stencil, you’ll want to start thinking about paint colors for your stencil and, if necessary, the wall. Stencils don’t have to be the mono-colored. You can use two or three colors. Additionally, consider painting the wall or room, if it’s not the right background color. 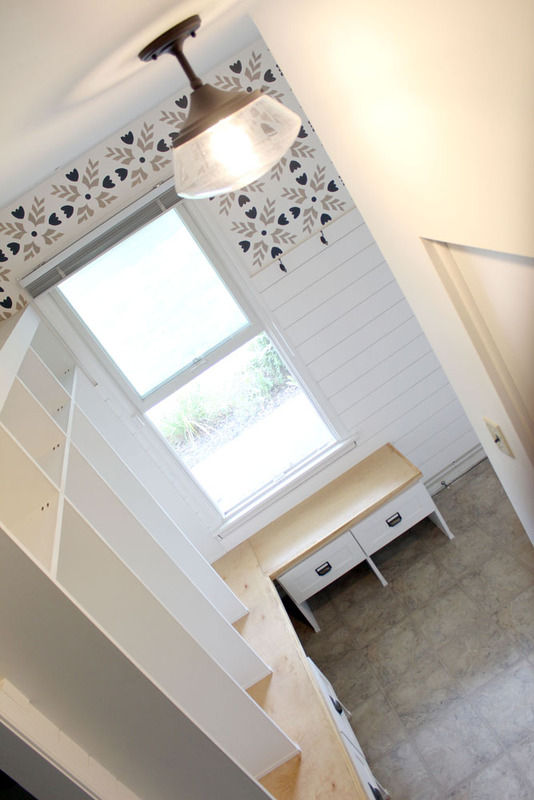 We painted over our beige mudroom with white paint, as we wanted the background of our stencil to be white. Then we chose two colors for the stencil – tan and charcoal. When you’re deciding on colors for your stencil, try them out with the stencil in a test area. I had a few different versions of tan before I settled on my favorite. 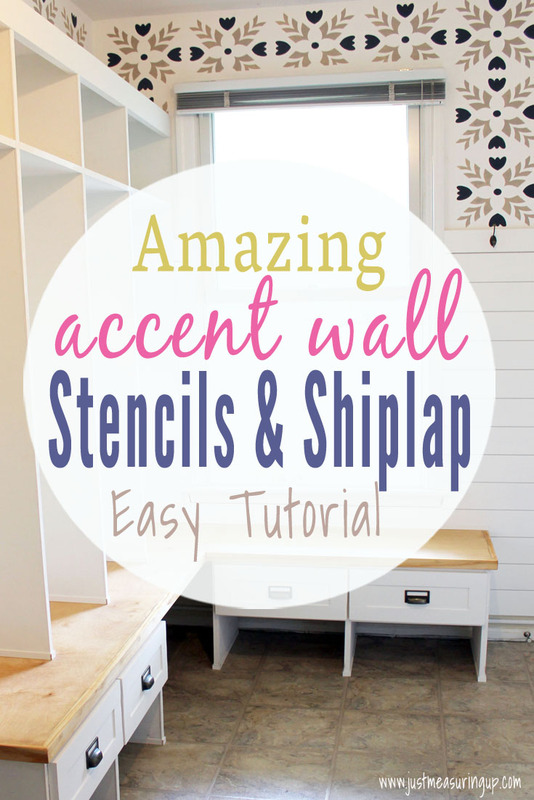 You can try the wall stencil on an area of your wall that will be covered (I tried mine where the shiplap was going) or you can use a foam board. Paint Tip: When choosing paint for the stencil, it doesn’t need to be wall paint. You can use acrylic paint from the craft store. Using the small acrylic containers from the craft store make it really easy to test colors too. Next, you want to prepare your wall. If you are painting the wall first, you’ll want to do that now. If you want to wipe down your wall or the baseboards or tape off any area, you’ll want to prepare that before starting to stencil. Side note – If you’re painting your wall white over a darker color like we did, it can take extra coats to get back to white. Keep that in mind when you’re thinking about your project timeline. Choose an ideal starting point for your wall stencil. Ideally, this is the spot where you’ll want your wall stencil to look the best. The most visible part of the room is always a good choice. Keep in mind that at the opposite end of the wall, depending upon the length of your wall and the size of the stencil, the last stencil could cut off. When you’re making your starting decision, factor in the opposite end or ends of the wall. Depending upon your stencil’s design, you could nudge your starting point just a little bit to help the opposite end terminate at a better point. Or if you get really lucky, the stencil might fit perfectly across the whole wall. I started the stencil right next to the window, as this part of the wall was the most visible when walking into the room. The stencil cut off at the opposite end of the wall, but I started the first stencil a half an inch inward, so the last stencil would cut off exactly halfway. I was okay with it cutting off there because that end was in a more hidden corner of the room. Note – The starting point for the stencil doesn’t necessarily need to be where you first start painting. It’s just where the stencil pattern starts. You could begin painting in a less visible area, such as toward the ceiling, so that any early mistakes are made high up, where people won’t be able to see. Next, you’ll want to attach the stencil to the wall. To do so, I just used four pieces of painter’s tape. It was super simple. When you’re done, you just peel the stencil and tape off and move to the next spot. Some people like to use a spray adhesive, but I found that unnecessary. The tape was very simple. 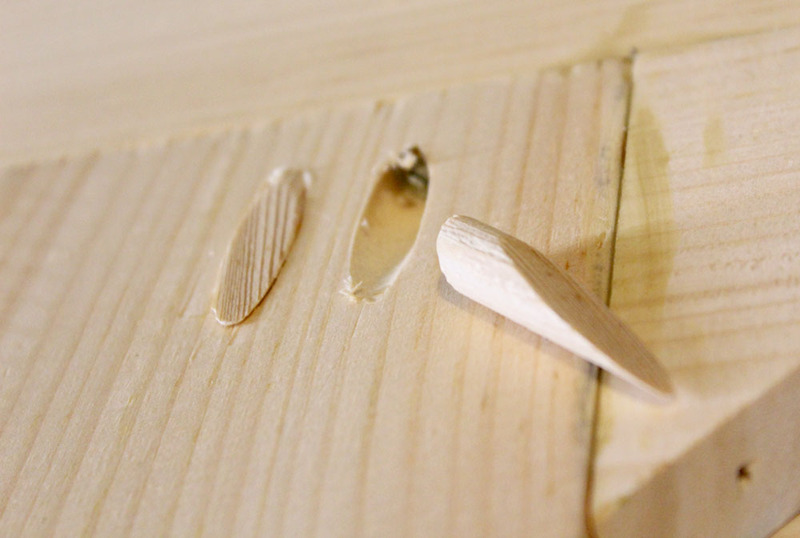 Step 5 – Use a small rounded brush to start dabbing on the paint. Now the fun part! To stencil the accent wall, you’ll want to use a rounded, stiff brush to stencil your wall. If the brush is too soft, it will bend. The best brushes are rounded that come to a point. With your rounded brush, you are just going to dab the end of your brush in the paint. Do this as evenly as you can, and then blot the extra paint. This is important because if your paint is too thick, it will slip under the stencil and cause unclean lines. A little paint goes a long way. As soon as your paintbrush is ready, gently dab it onto the wall. When you’re painting the wall, don’t use brush strokes, just stipple it onto the wall. Now it won’t be perfect. But with a small amount of paint and a small rounded brush, it will be pretty close. Brush Tip: As for brush size, keep in mind that a smaller brush will get you more accuracy and a bigger brush will get the job done faster. You could use a bigger brush in higher areas, where people won’t be able to see up close (because it goes faster) and a smaller rounded brush in lower areas. Simply peel back the stencil and remove. If there are any stray marks, you could always wipe with a paper towel or a baby wipe before it dries. Then, line the stencil up with the registration marks (see above) and work on your next stencil. It will be slow going at first, but like anything, it gets quicker as you get used to it. For our mudroom wall, I only stenciled the top third of the wall. 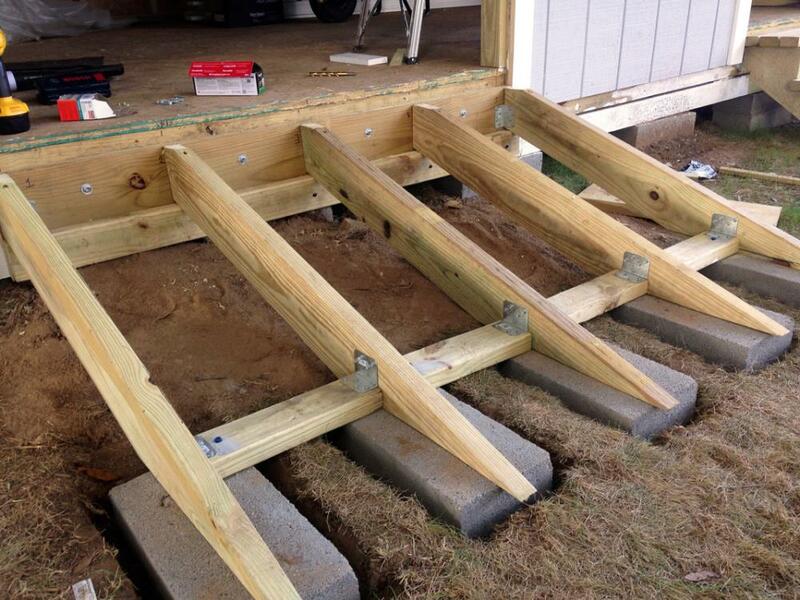 On the lower part, I attached shiplap, which made for a really cool look. I also ended up stenciling more than I thought. 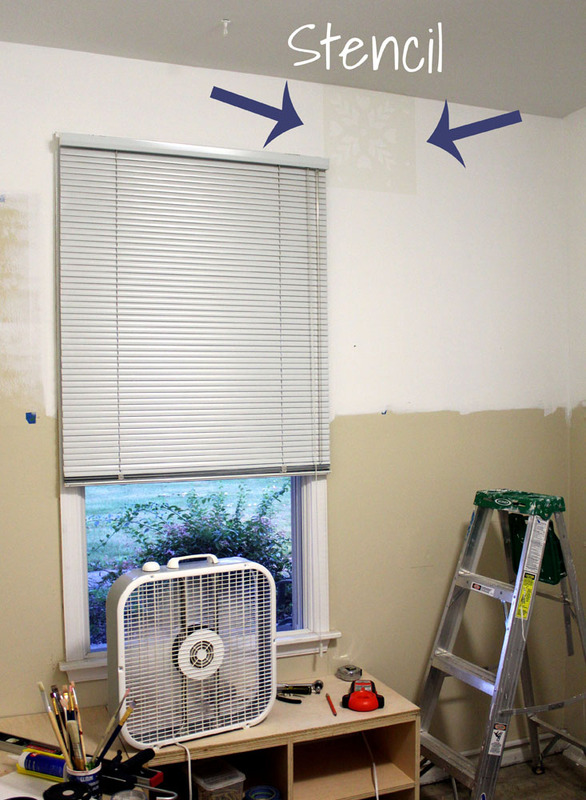 My plan was to just stencil the wall around the window, but I kept going around the doorway of the laundry room. If you are undecided on whether to continue the stencil on a neighboring wall, you can start with the wall that you are sure about. Then, go from there. Stencil Cut-Off Tip: If you are doing a lot of stenciling and your wall stencil cuts off at the corner or around a window, you could do a couple of things. You could simple bend the stencil and tape it. I would use a lot of tape so it doesn’t slide when you are painting. It’s a little tricky to do but that’s what I did (see picture above). Or, you could order more than one stencil, and cut the stencil so that you have a flush fit when stenciling around windows and near corners. Here’s a close up of the finished wall, with the stencil at the top third, and the shiplap at the bottom. 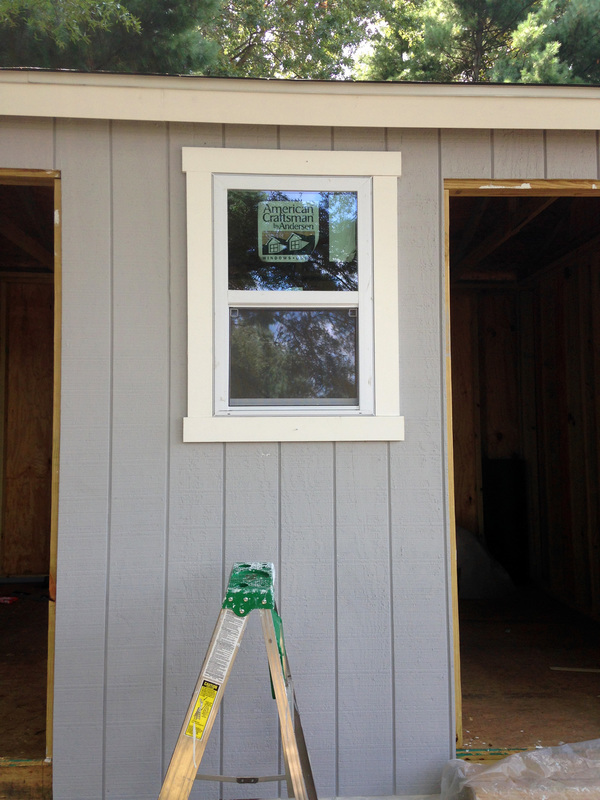 Here’s a few more pictures of the other side of the room, including the portion above the laundry room nook. 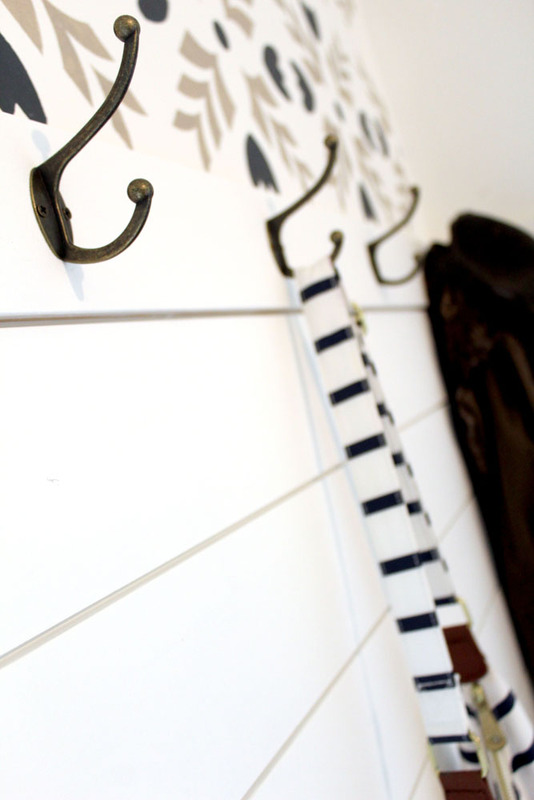 And, I just adore these hooks! They look perfect with the stencil and the shiplap. I think there’s about 16 of them in the mudroom now 🙂 They’ll be no excuses for bags and coats not hung up. If you’re debating whether or not to stencil a wall, definitely go for it. 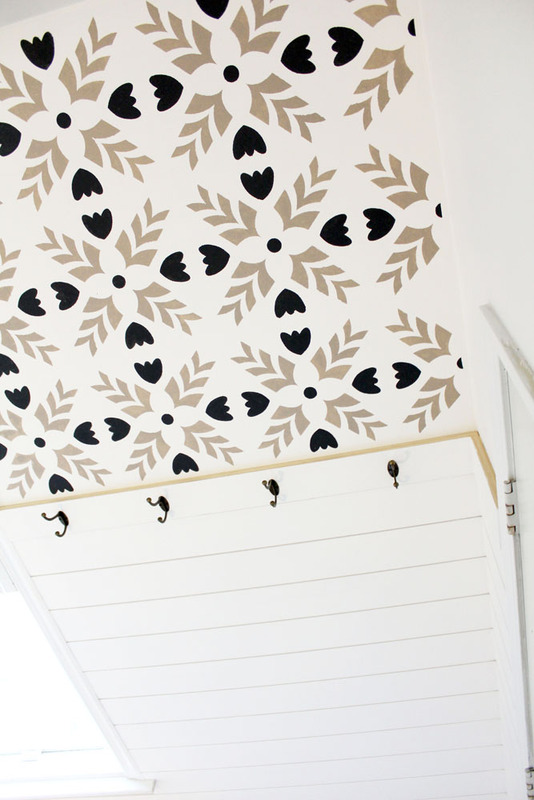 Stenciling a wall is an easy, budget-friendly DIY. With a little bit of work, you can completely transform the look of a room. If you love the way the shiplap looks on our accent wall, that post is coming next, and our whole mudroom makeover will soon follow. So, there we have it! 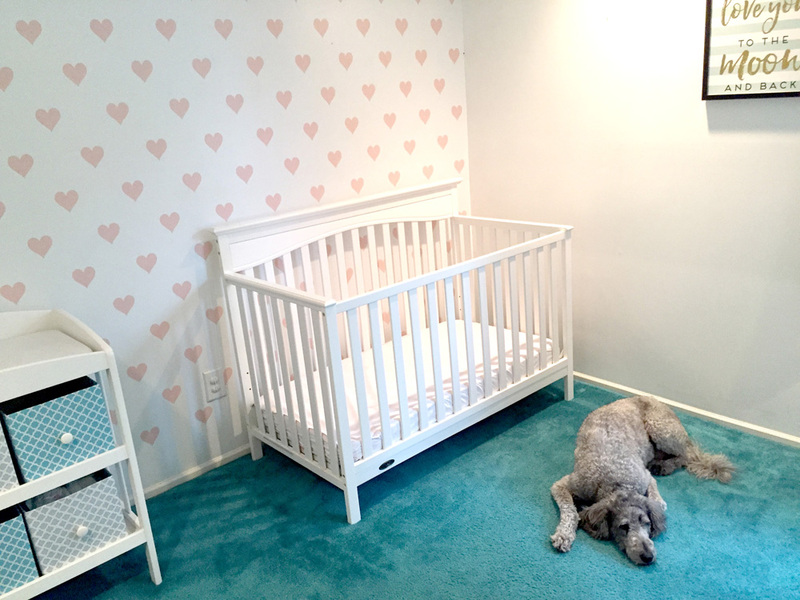 A completely transformed room with something as simple as a wall stencil. 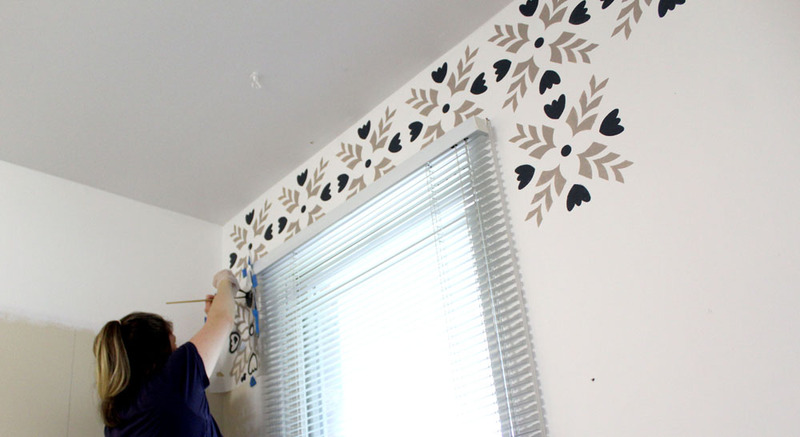 If you are looking for a thrifty way to redo an old space, definitely consider stenciling an accent wall. Every time I walked into the house, I cringed. Every time I did laundry, every time I went to grab my coat, every time I went to get the mail. I couldn’t stand our mudroom, and I was constantly in and out of it. It was a tight space with a bench blocking the window. The bench filled up quickly with backpacks, hoodies, and amazon boxes. There wasn’t any place to put anything down and then of course a third of the room was a huge closet. It was beige-y, boring, and not functional for our family. We had big plans to knock out the closet and put in countertops and cabinets. However, we didn’t have the time or budget to take that on this summer. We thought that we were stuck with this room as it was. However, we changed a few things here and there – and it started with painting an accent wall and building cubbies. Before we knew it, we had a whole new room even with the old closet. 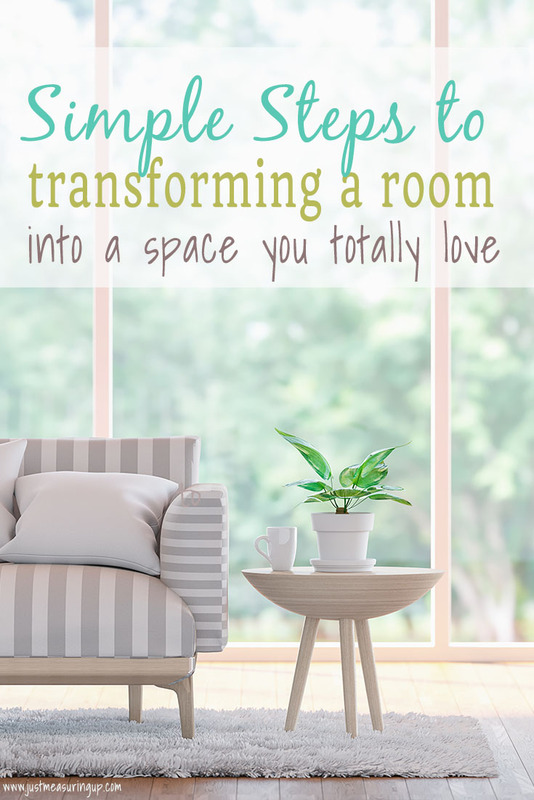 So, here are our 4 proven steps to transforming a room in your home. If you love these, check out our room makeover workbook and you’ll be on your way to making over a room in your home too! 1. List the things that drive you crazy. The first thing we did was think about what we didn’t like about the room. Figuring out what we didn’t like (other than just saying “ugh I can’t stand this room!”) helped us see what we could and couldn’t fix. 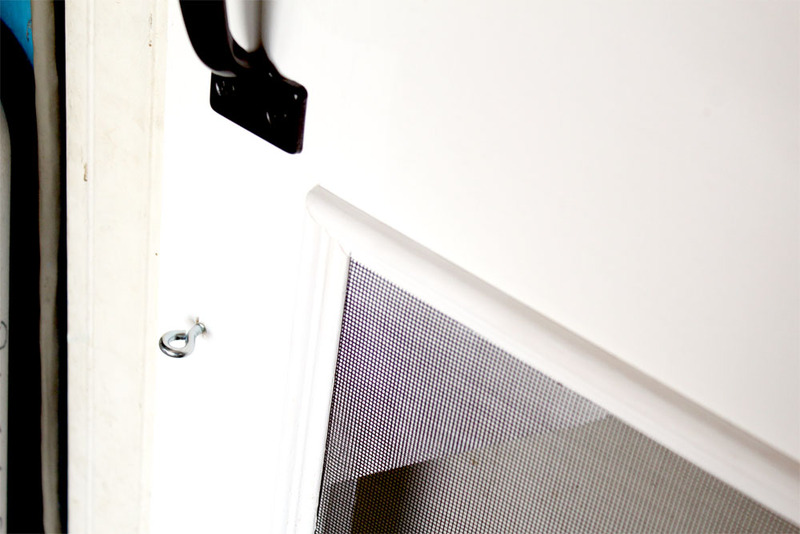 Here’s our list of things we didn’t like about our current mudroom. There was nowhere to store coats, shoes, and backpacks – and therefore was always a mess. There was not enough light. It was a boring space – beige paint, beige and brown floors. And, there was the huge walk-in closet, taking up a huge chunk of the room. 2. Brainstorm fixes for each item on your list. Next, we jotted down a fix for each thing that drove us crazy. 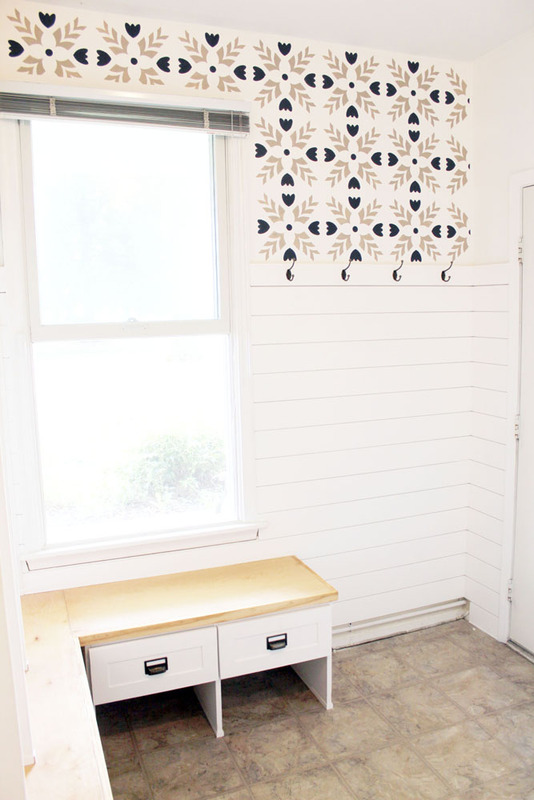 Boring space –> Paint, stencil an accent wall, install shiplap? 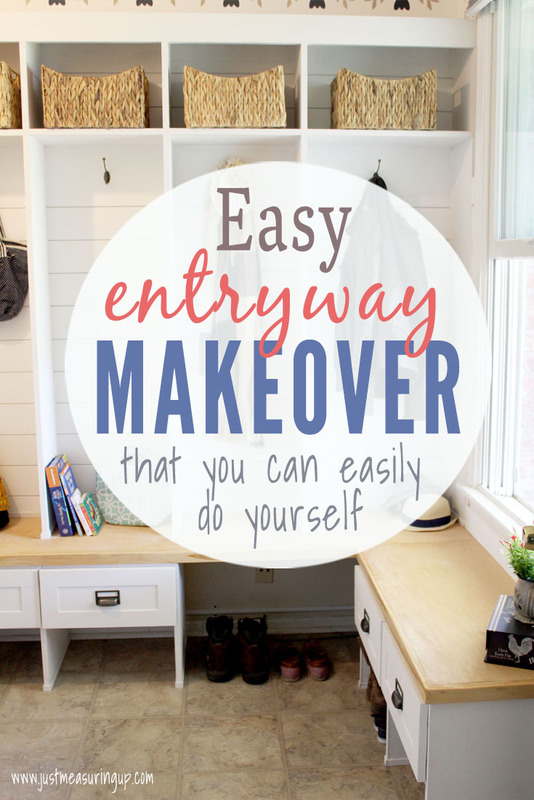 By simply listing out the problems and fixes, we had ourselves a blueprint of what our mudroom makeover would look like. 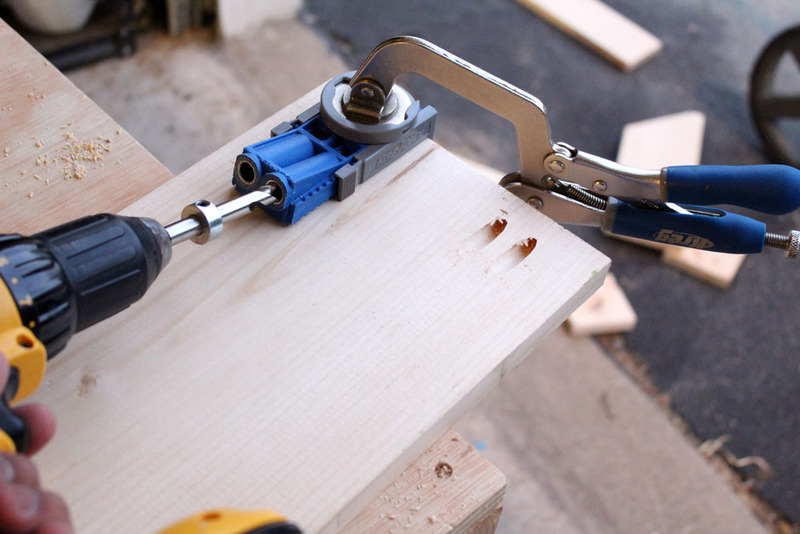 Now, we weren’t planning on tackling the closet/countertop fix this time. However, that’s okay! 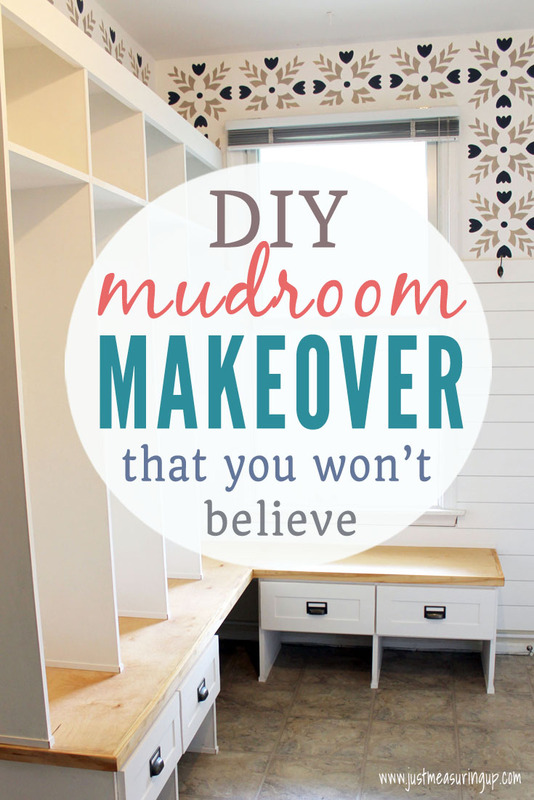 With all of the other changes, I was certain our mudroom would get its much needed makeover. 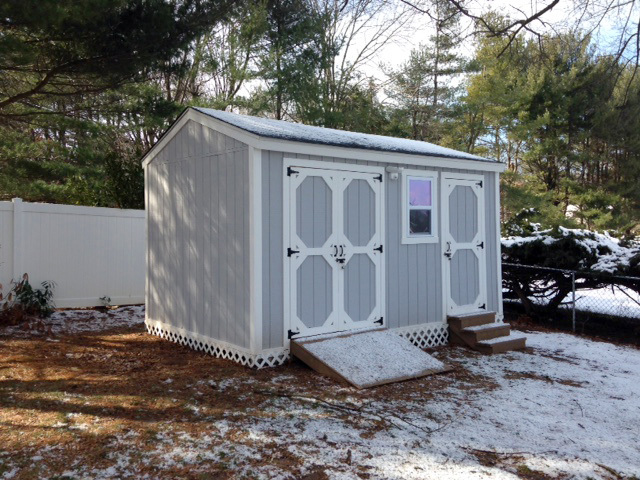 Here’s an after picture – what do you think?! 3. Make a master list – break large goals into smaller action items. 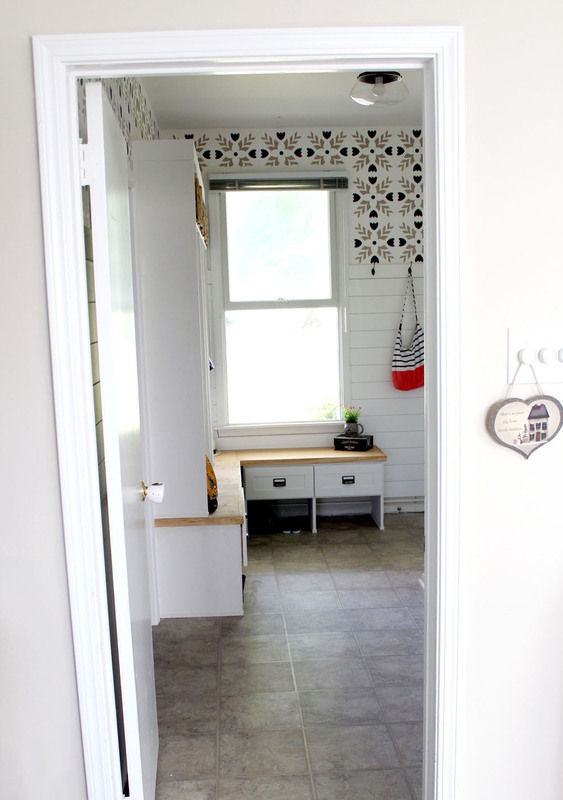 In order to get our mudroom from the before picture to the after picture, we took our list of fixes (above), and then we turned it into our master list. We had four main items to work on. Breaking large items into smaller ones make them more manageable and it gives you direction on what you need to do next. Also, action items keep you from getting overwhelmed or wasting time. 4. Set goals to complete action items each day or week. Now that we had a master list with manageable action items, we set goals each week to complete certain action items. Each day, we chipped away at our action items, crossing things off the list here and there. 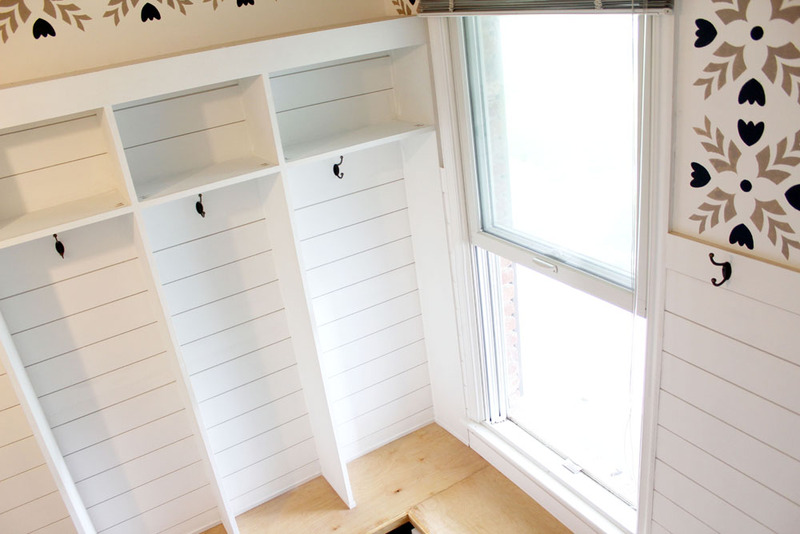 It took us a month – but we had an incredible mudroom makeover. The process of listing out the problems with the room, then determining solutions worked so well for us. 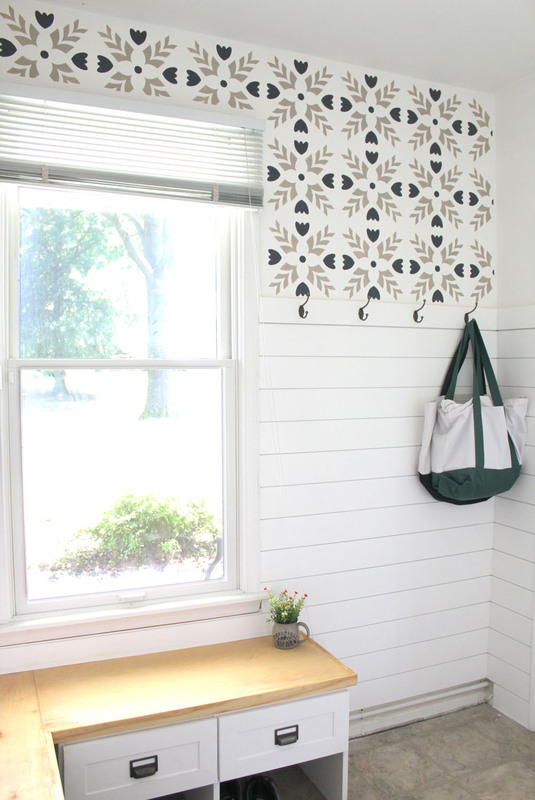 All of the years that we’ve lived in this house that I spent frustrated with the mudroom or complaining about it, could have been channeled productively through creating solutions and chipping away at the projects. I mean, you can’t tell that it was the same room! Looking to transform a space in your home? 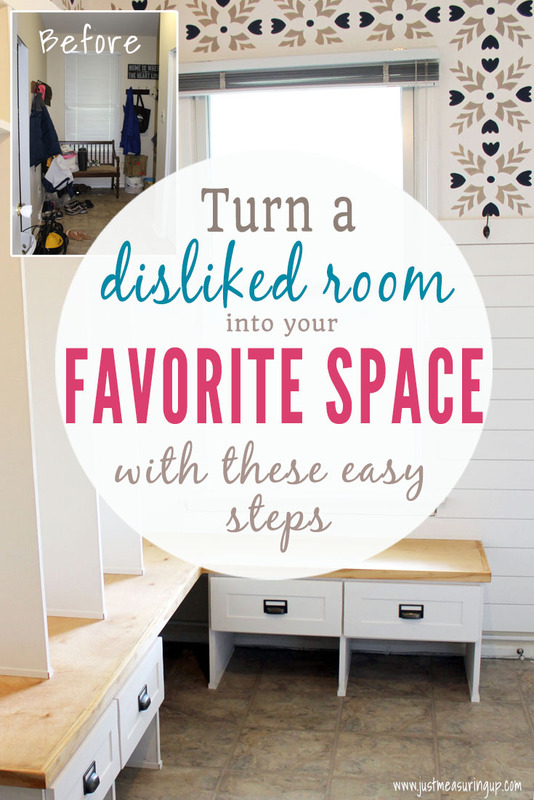 Tired of the room or space driving you nuts? 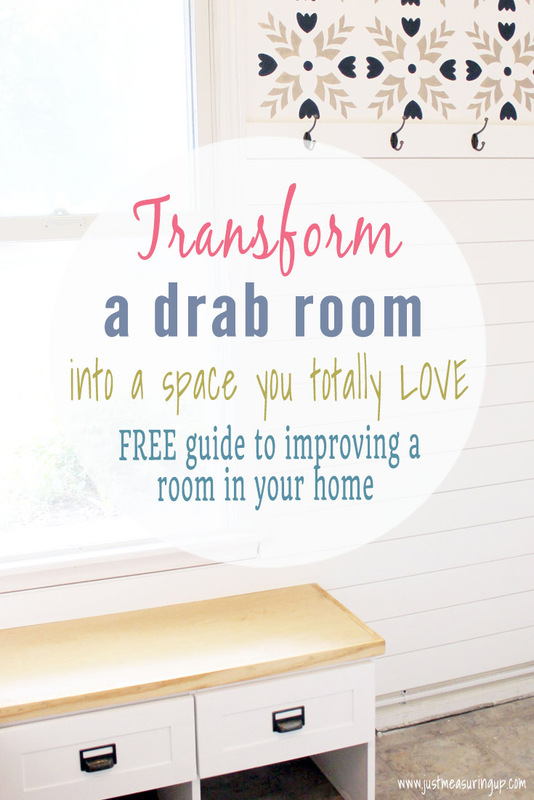 Check out our Room Makeover Workbook to guide you through transforming a room in your home in just 33 days! 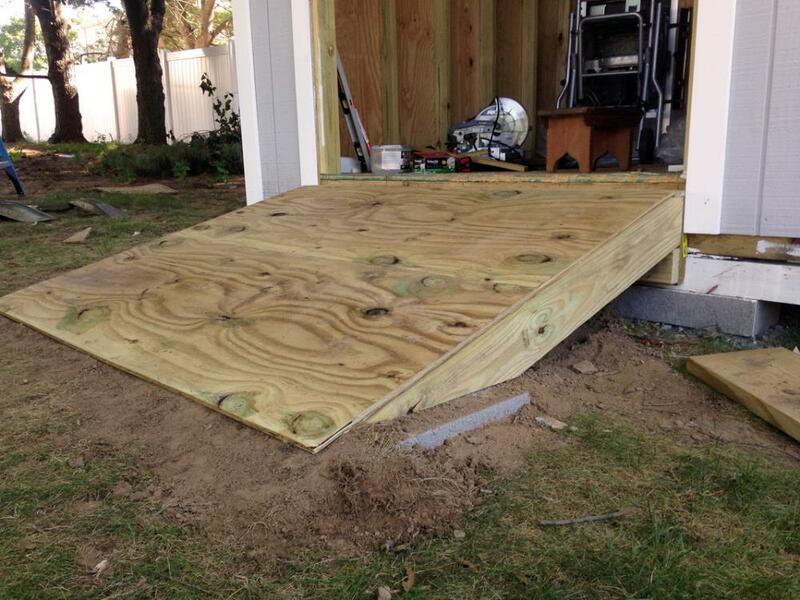 We will take you step-by-step through the process of making over your space. For some reason, flies love to hang around in our garage. As annoying as they are in the garage, they are even worse if they make it inside the house. I finally got tired of chasing after flies in the house and decided to install a screen door leading into the garage. Now, in traditional Just Measuring Up fashion, I wasn’t about to just buy one from the store. I had lots of wood left over from previous projects, so I decided to just make my own door. I just needed to buy some hinges and insect screen. I had a basic idea of what I wanted the scrap wood screen door to look like. Since I was retro-fitting a custom door in the door frame, the dimensions were customized to fit within the existing doorway trim. The long boards for the screen door I cut with my table saw, while the triangle trim inserts were done with left over scrap wood using my miter saw. I used whatever surplus boards I had lying around the garage. If I were to buy boards from the store, I would be fine with just two 1′ x 10′ x 8′ boards. 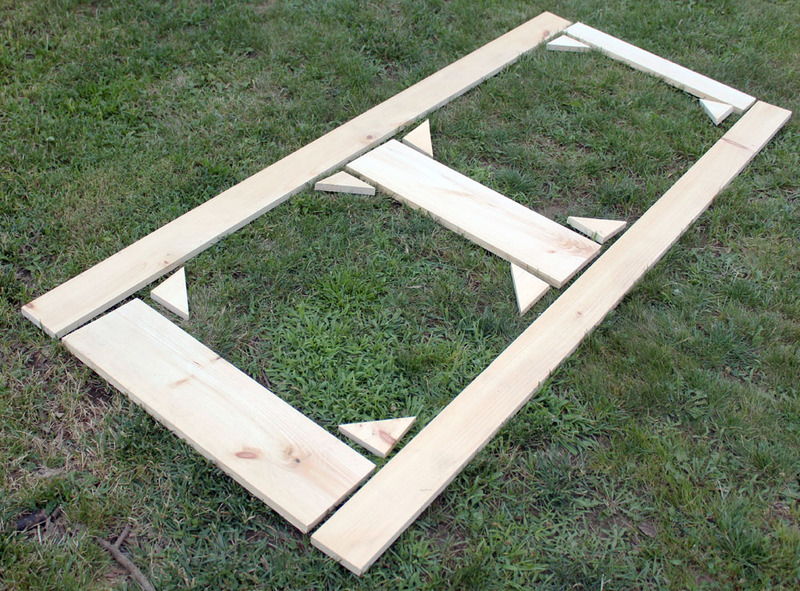 Next, I had to join the pieces together to form the screen door. There are lots of different ways to join these pieces. 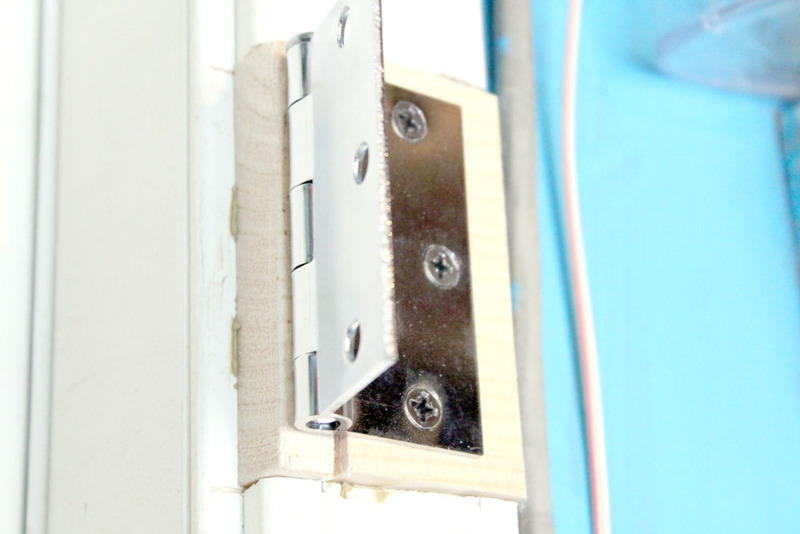 I opted for the simplest method of using pocket hole screws. 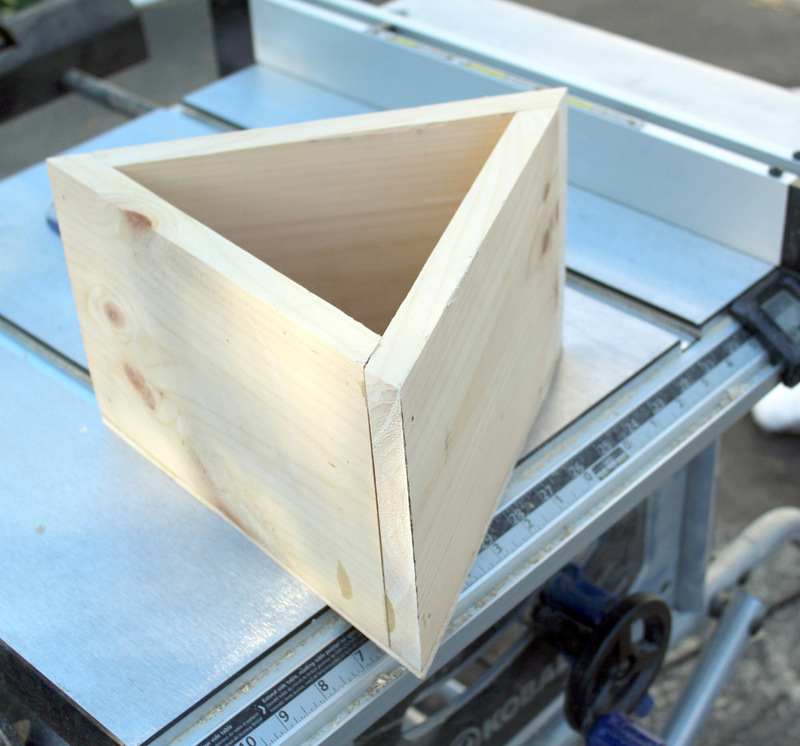 I used my trusty Kreg pocket hole jig. Pocket holes joints do leave visible holes. Normally, I don’t mind them. However, I wanted this screen door to have a more professional finish. 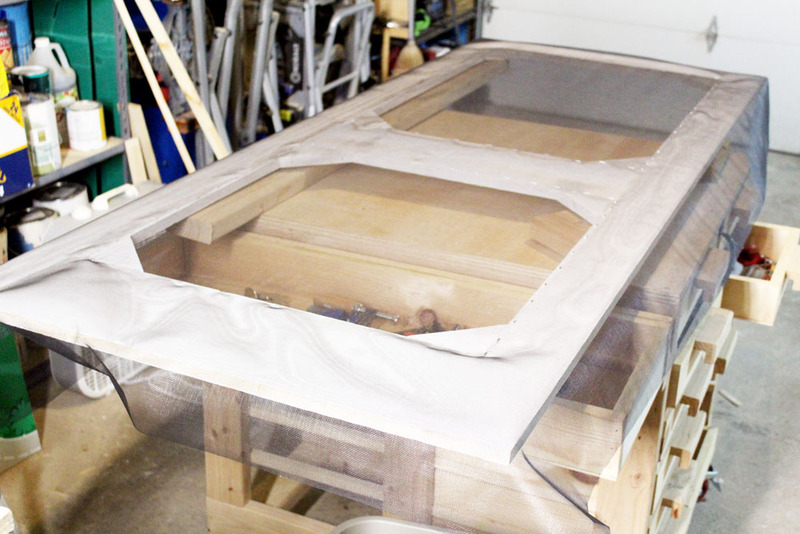 In making the scrap wood DIY screen door, I didn’t use any pocket holes for the triangle inserts. I just used some construction adhesive and two finishing nails. 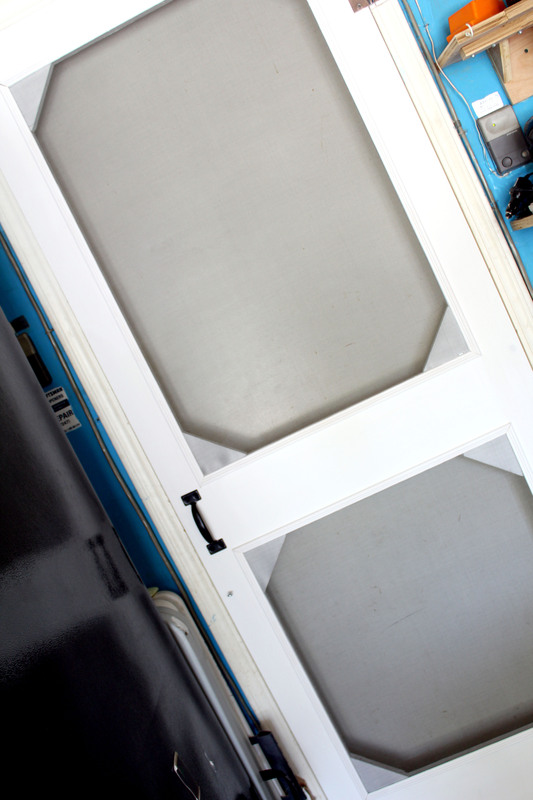 For my particular set up, it was more practical to install the hinges on the outside of the screen door frame (rather than inside, like typical door hinges are). So rather than screwing the hinges directly into the screen door trim (which would be hideous and not very strong at all), I decided to make simple mounts for the hinges. I cut out a small segment of the existing doorway trim, and inserted a block of wood. 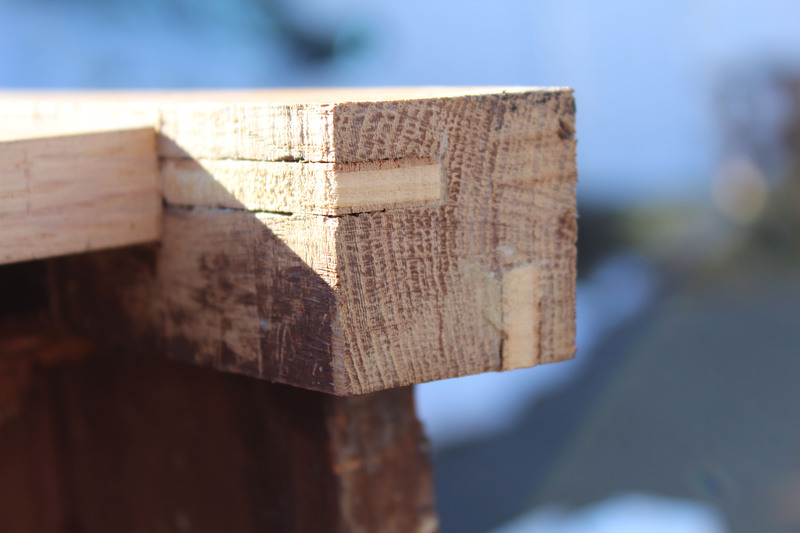 This piece of wood was both glued and screwed into the doorway to make a strong mount for the hinges. While attaching some of the screen door accessories (like hinges, handle and magnetic catch), I realized some of the screws were a bit too long. They were sticking out the other side of the door. I remedied this by shortening the screws to the thickness of the door. 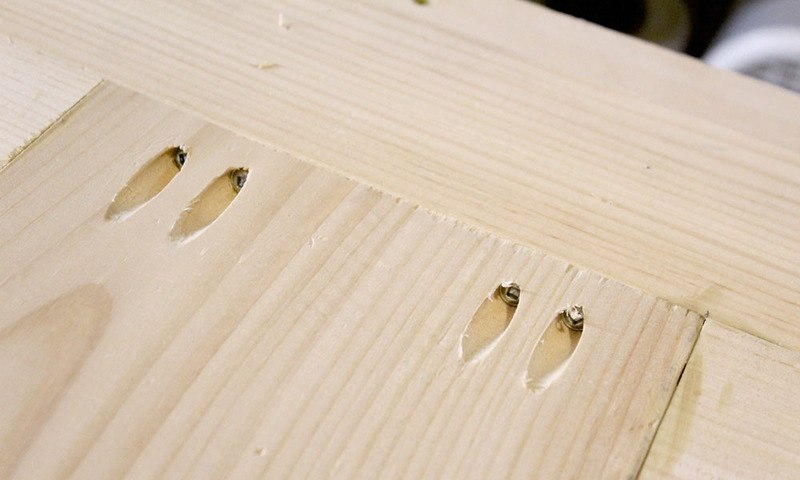 To trim the screws, I drove them into a scrap piece of wood. Then I secured the wood in a vise and used my handy Dremel to cut off the protruding parts of the screws (via a reinforced cut-off wheel). I made sure to wear gloves and safety goggles for this, as lots of sparks fly when cutting metal. 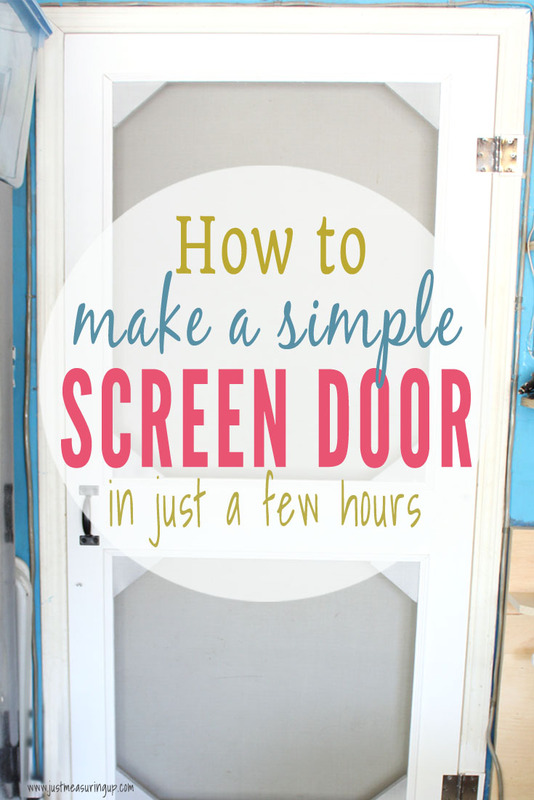 To attach the DIY screen door, I placed it in the doorway and positioned it in place. 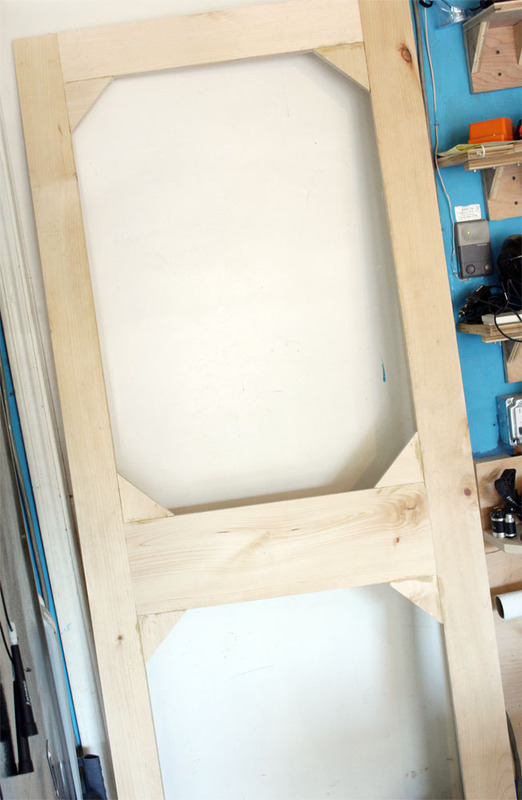 I needed a 1/8″ gap between the door and the frame. So to ensure a consistent gap along the entire perimeter, I used several wooden shims underneath and along the edges of the screen door. 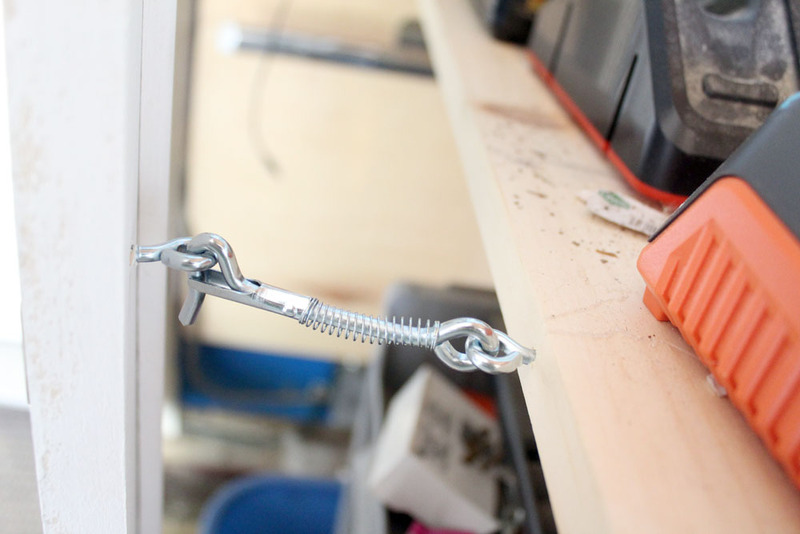 Once I was satisfied with an even 1/8″ gap, I screwed on the hinges to lock the screen door in place. 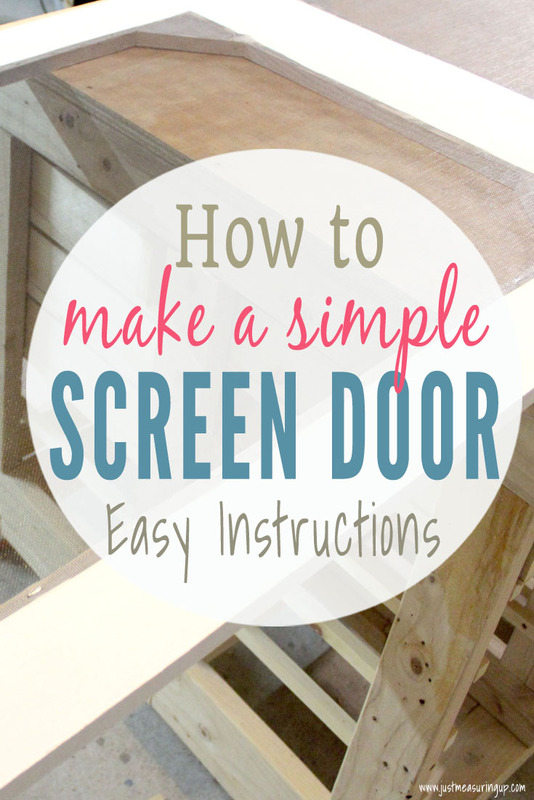 For the moment of truth, I pulled out all the wooden shims and watched the screen door swing freely. Next, I attached the door handle and a long spring to self close the door. However, I noticed that even with the spring in place, the screen door didn’t remain closed all the way (there was about half an inch of a gap). So I used a magnetic catch to keep the door pulled in all the way. 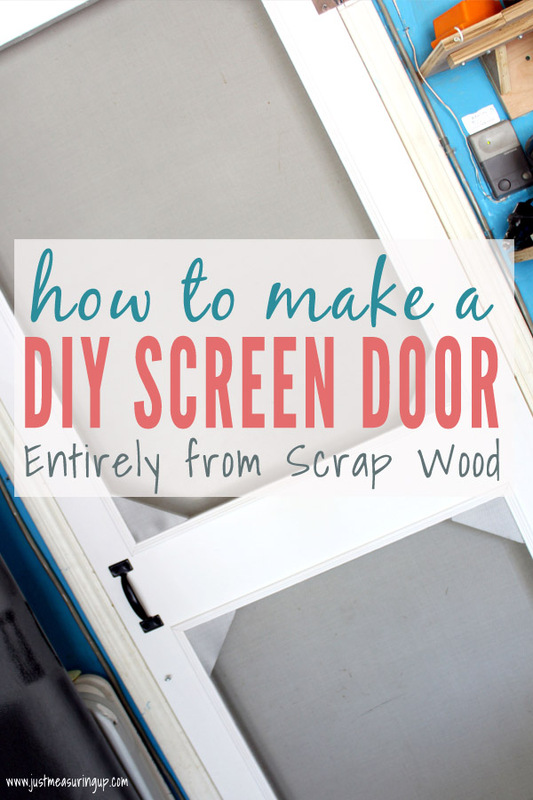 The DIY screen door made from scrap wood was complete! The DIY screen door only took a few hours to complete (although I had to wait extra time for paint and glue to dry). Since I reused extra wood left over from projects, my total cost for the DIY screen door was around $30 (for screen, hinges, spring, handle). And, the flies? They can longer get into the house. And that, my friends, is a win. 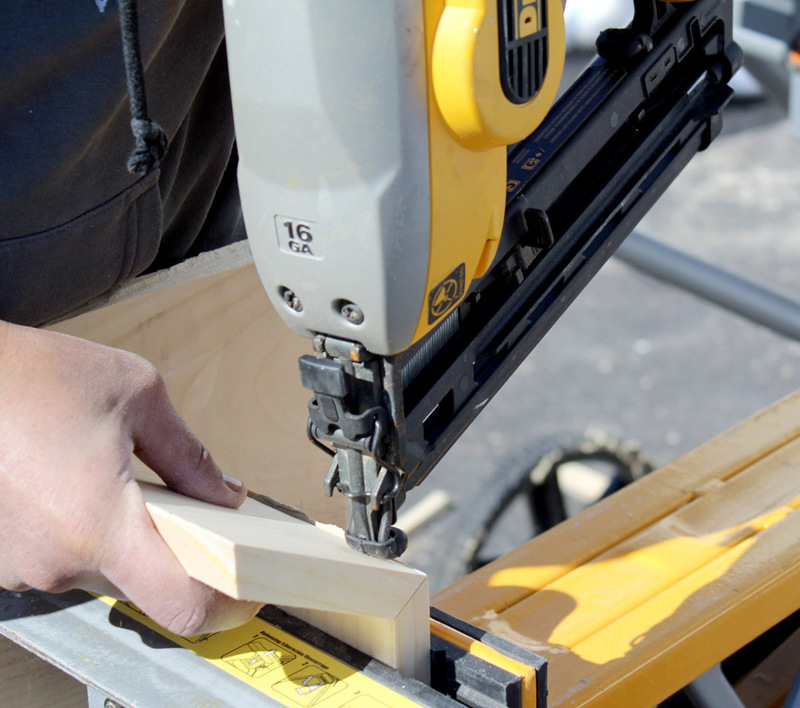 With so many DIY projects in progress, our garage is usually a hot spot of disorganization. I finally got around to organizing my garage (again) last weekend. When it was all done, I stood by the door admiring my handiwork, hoping that this is the last time I need to do a garage organization overhaul. This time, the garage is really efficiently organized. 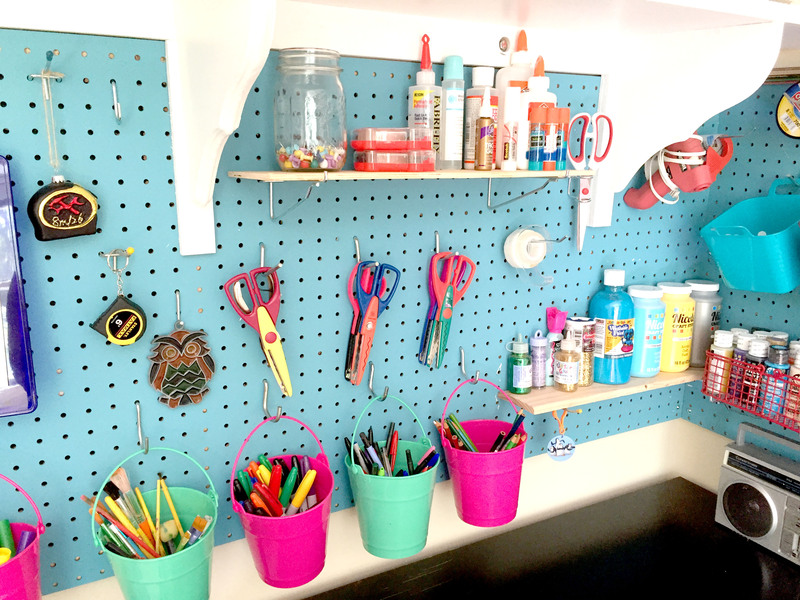 There’s tons of DIY garage storage shelves, lots of folding and rolling work spaces, creative nooks that house frequently-used items, and a few fun things as well! Now that every single thing has a place and is neatly organized in the garage, it makes me want to start a DIY project right away. 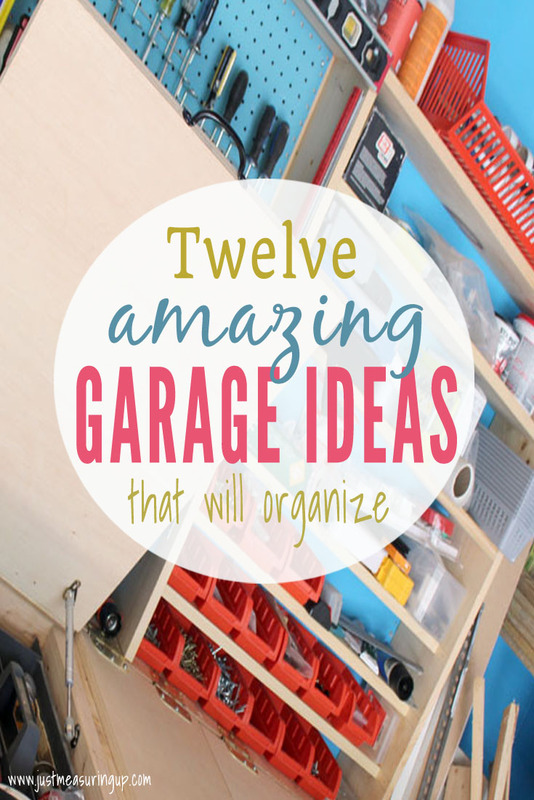 But before I do so, I wanted to share these DIY garage storage ideas with you. 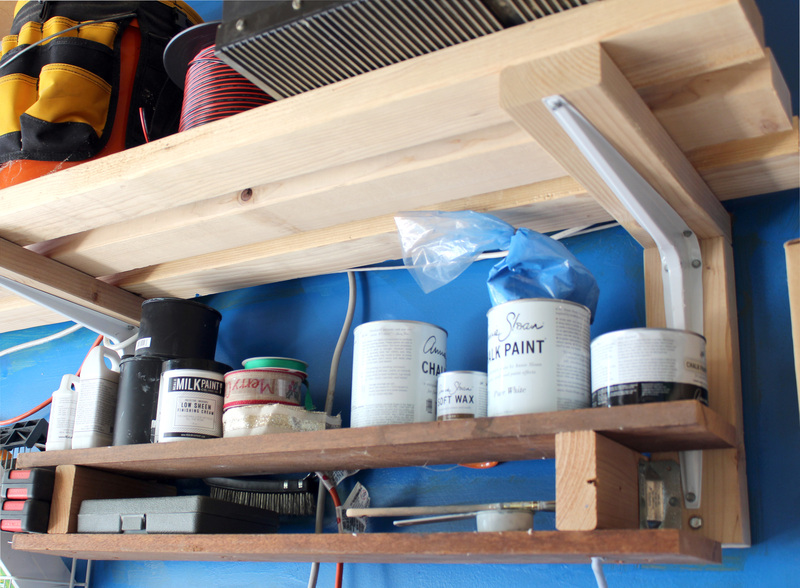 Without further ado, here is list of 12 things around my garage that I made or bought to help organize DIY projects and efficiently store tools. 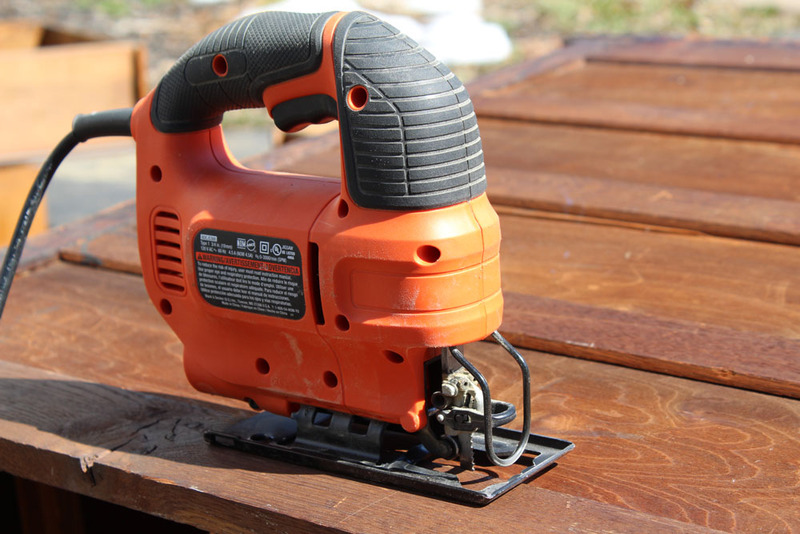 Over time, I have accrued a number of power tools with different types of batteries. I believe I have 8 different types of battery chargers. Now when I buy new cordless tools, I try my best to find ones that will work with my existing batteries. Nevertheless, I am still stuck with an existing assortment of battery chargers that need to be organized in my garage. Managing all of them can get messy, so I decided to centralize them into a battery charging station. It’s just a simple L shaped storage shelf off the side of one of my workbenches. This DIY garage storage idea has organized my batteries perfectly. 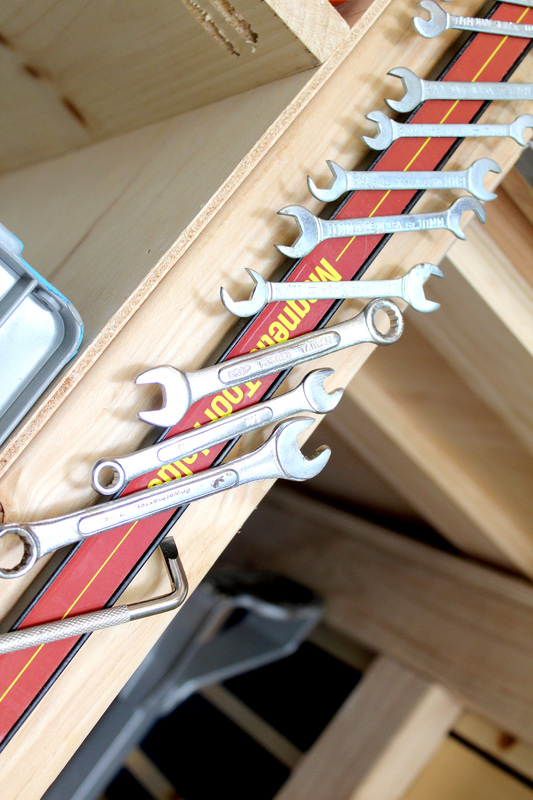 Of all the DIY garage storage and organization ideas, this is one of my favorites. 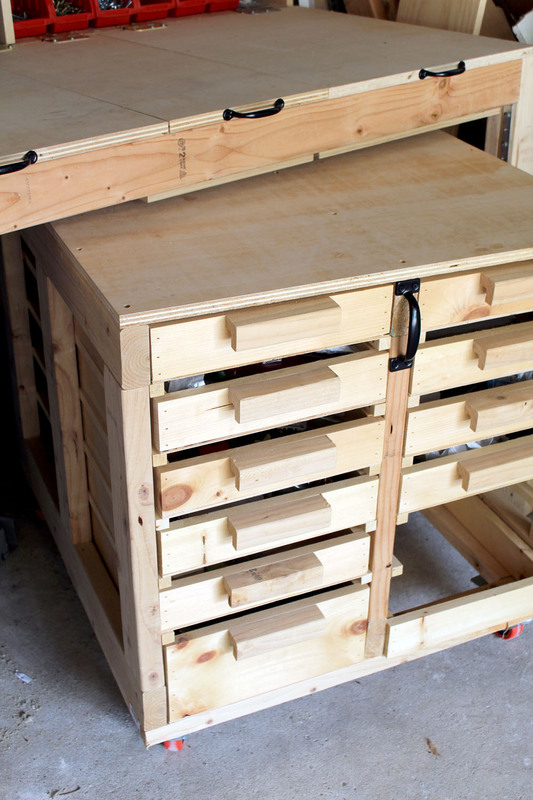 I recently built a new rolling workbench, and mid-construction I thought about how much potential storage space was being wasted inside. I am always on the lookout for making use of idle spaces, so I came up with the idea of hidden storage for the workbench. 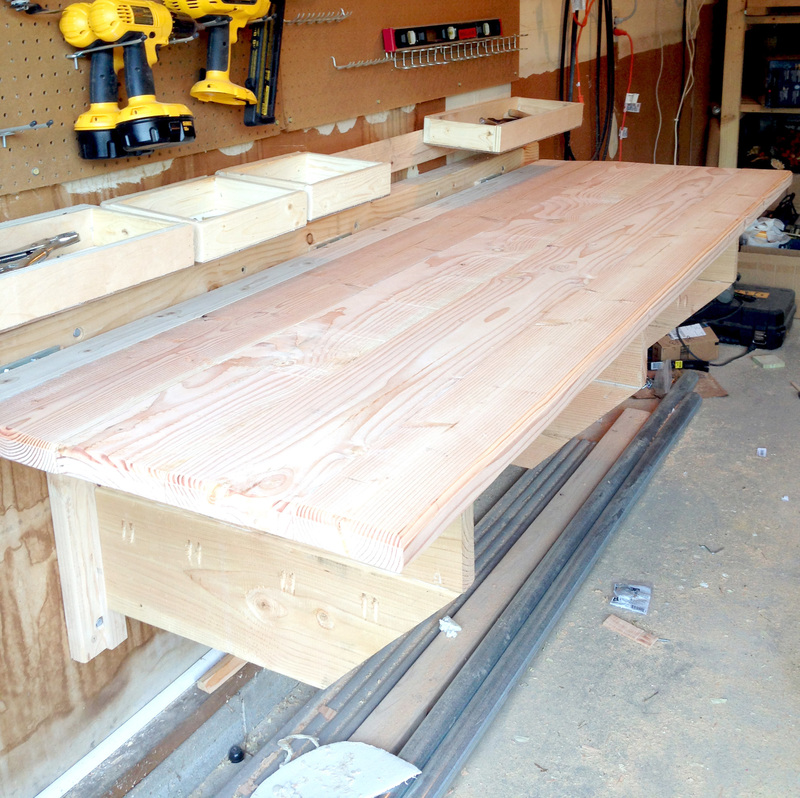 So, I divided my workbench into 3 sections, and attached the top with hinges. Just under the table top, I now have huge drawers of garage storage space. To make it even cooler, I installed some pneumatic lid supports to keep the lids in place when open. The supports also make it a lot easier to open since the lids are pretty heavy. 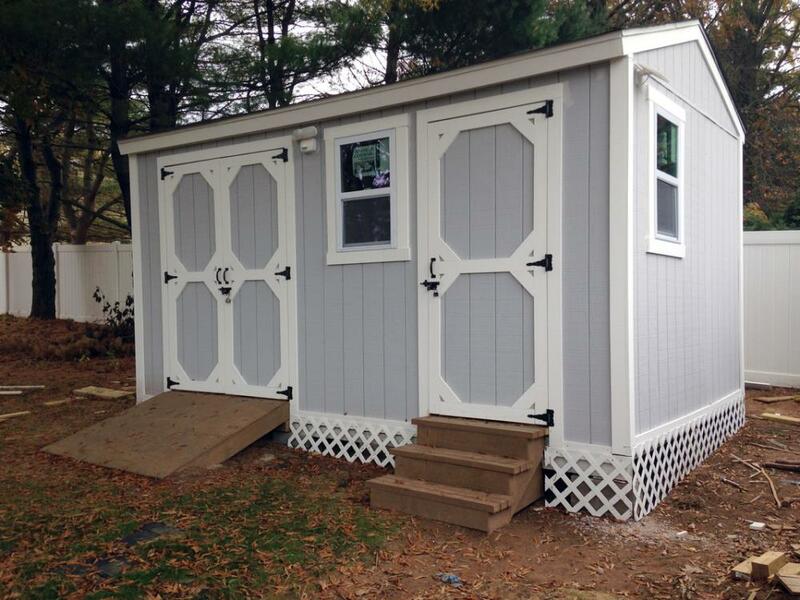 I can’t tell you how many times I’ve wanted a workspace in the middle of the garage or out in the driveway. So I finally drew up some garage plans for a rolling storage table, with a lot of emphasis on storage and organization. The rolling table with storage is turning out awesome. My custom table has drawers on both sides for maximum organization. I use locking wheels so the table doesn’t roll when in storage or when I’m working on it. Even the height of the table was carefully taken into consideration. It’s the exact height as my table saw. So when I am cutting large pieces of wood with my table saw, I can just roll out my table for extra support. 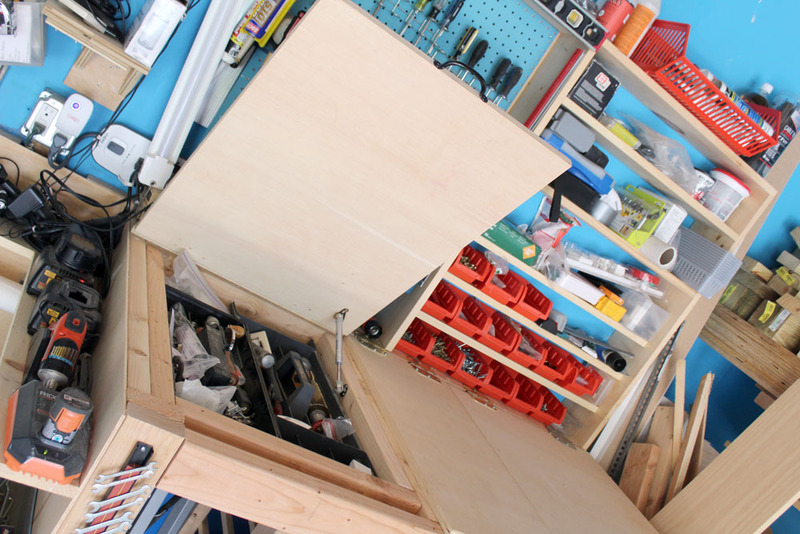 When I’m done with the table, it rolls away to fit under my garage workbench and serves as static drawers. Don’t mind the missing drawer in the picture! The table is still under construction, but very usable in its current state. As much as I love my garage workshop, it still is just a garage. As such, our cars need to fit in there from time to time. So, to strike a fine balance between a solid workshop and a working garage, I constructed a folding heavy duty workbench. The folded workbench is mounted on the walls and supported by 3 floating legs. When I need to park the car in the garage, I push the legs flat against the wall, and the whole table folds down. 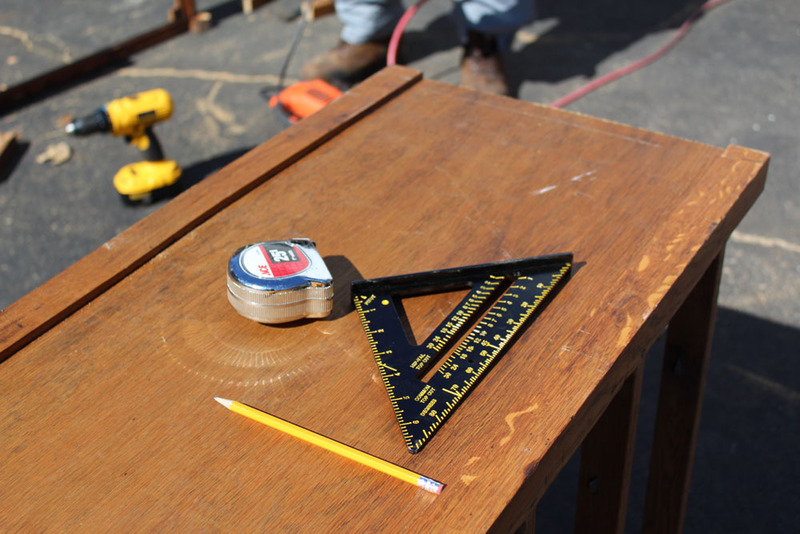 See my post for more details on this awesome folding workbench. 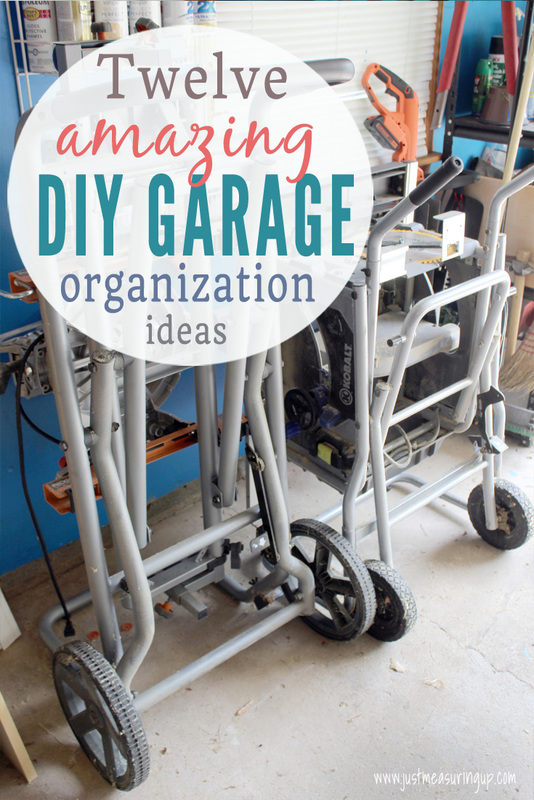 It’s definitely a must-have for an organized, functional DIY garage. A computer in the garage can be a really valuable tool. I like to sketch 3D designs of my projects on the computer. It makes it easy to visualize how something will turn out in end, and helps me determine how much material I will need. It’s also great for instructional YouTube videos. When I’m not using it for projects, I just use it for music at night to keep the projects pumping along. I built my own computer (made the case out of wood! 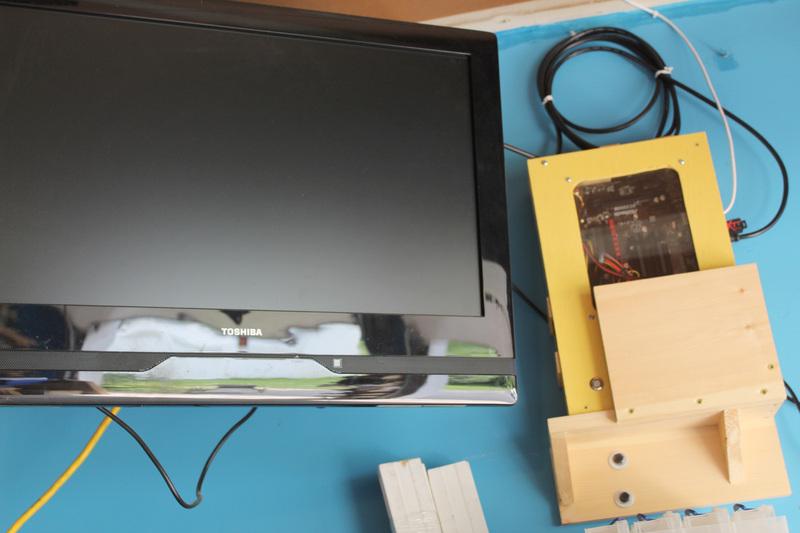 ), and mounted it high up on the wall next to a TV. No sawdust is going to get up there. I control with with a mini wireless keyboard and built in touchpad for the mouse. Check out my blog post for full details on my custom made garage computer – such an awesome DIY garage idea, right?! I have to admit – I may have gone a little storage shelf crazy in my garage. In fact, I even have sub-shelves attached to larger shelves. I can’t help it – they are so practical and useful. 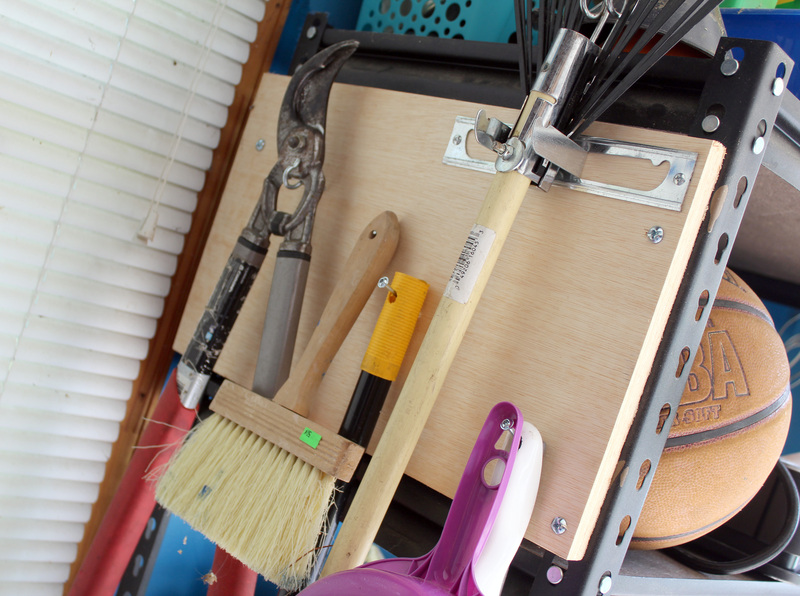 Here is a whole subset of DIY garage organization ideas for shelving. Here I have some metal storage shelving in my garage, but I took it to the next level by bolting on some plywood to the side to store an assortment of things (like rakes, brooms, and even a chainsaw). This has been so helpful to not have these items on the floor haphazardly. Using otherwise wasted corner space, I built a scrap wood bin, and attached some shelves above it to store the smaller pieces (that would normally get lost in a bin). The bin and accompanying shelves house all of my scrap wood, emptying out other areas of the garage. 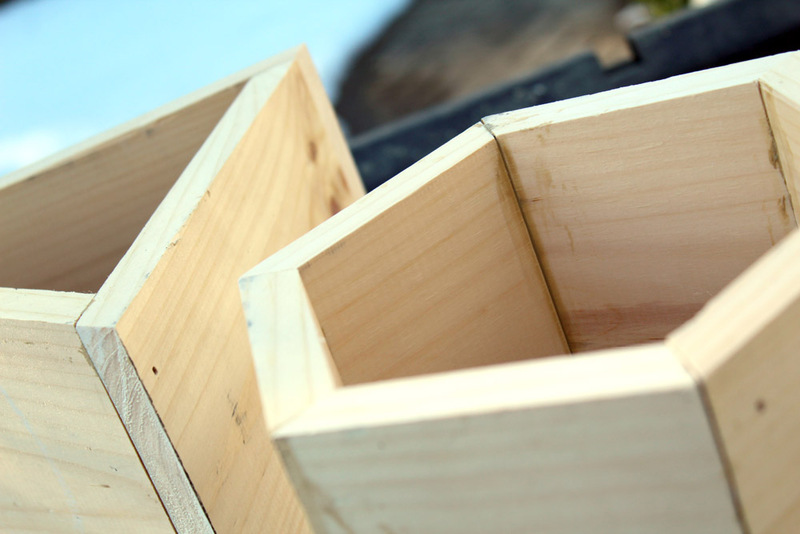 Plus, all of my scrap wood is easy to find for my DIY projects made entirely of scrap wood. Here is a mini shelf I built for holding some plastic drawers. The plastic drawers are holding the items for the computer/TV. Whenever I have an item that I don’t have a great place for, I just make my own little stand or shelf to hold it. I also made a storage tower with sliding shelves for the garage. It holds a TON of things on it. 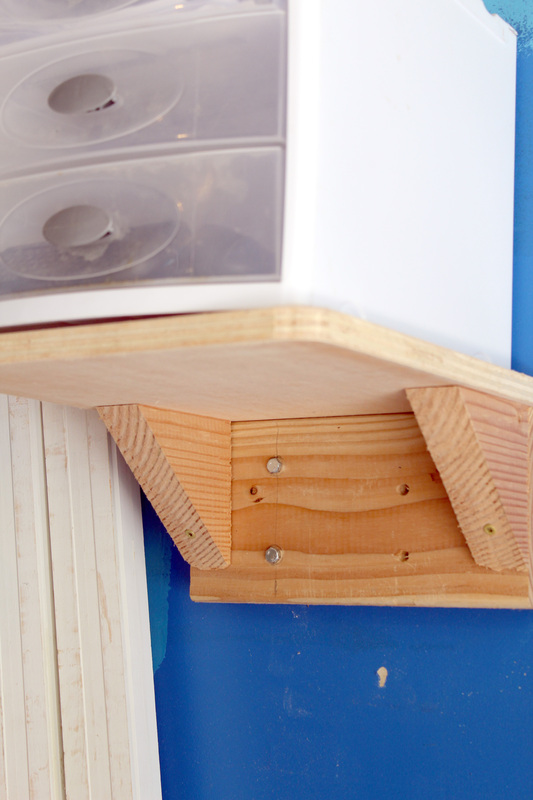 Check out the blog post for the sliding shelf organization plans and design. This is Eileen’s favorite part of the garage because of the all the storage. In fact, she’s been wanting a few of these storage shelves that slide in the basement. Here’s the sub-shelf I mentioned earlier. I couldn’t stand looking at the empty void beneath one of my larger shelves. So one day I tossed together some scrap wood for a mini shelf attached underneath. French cleat shelves are awesome. I made these storage shelves from scratch with a french cleat mounting system. They hang very sturdily off the wall, and lift off with ease for me to carry around on various projects. 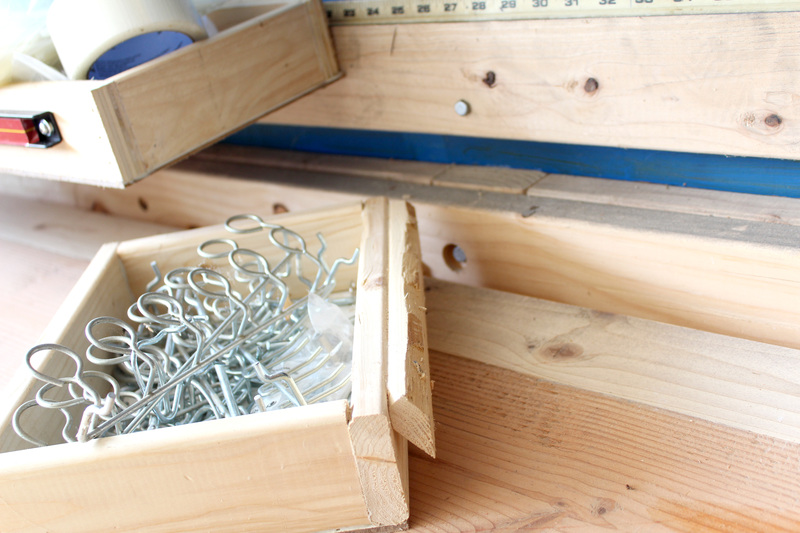 See my blog post about french cleat shelves to learn more about them. Here I repurposed some closet wire shelves for spray cans. My neighbor tossed them out one day, and my eyes lit up. Free storage! Don’t underestimate something that you or someone else is getting rid of – especially something that can be used as shelving. 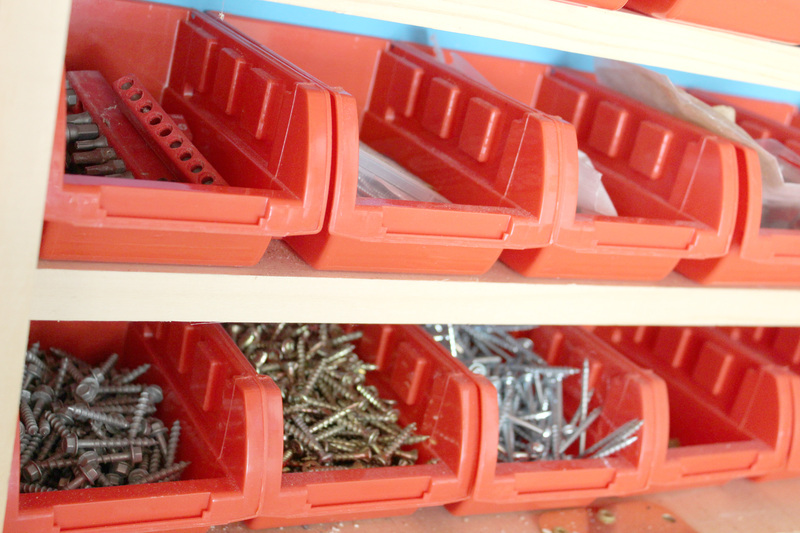 Storage bins are great for screws and commonly used things like driver bits and washers. I dedicated a number of shelves to just storage bins. I even mounted some storage bins to the wall for easy access. They are also very portable. You can take them around with you during your project instead of having to run back to the garage every time you run out. 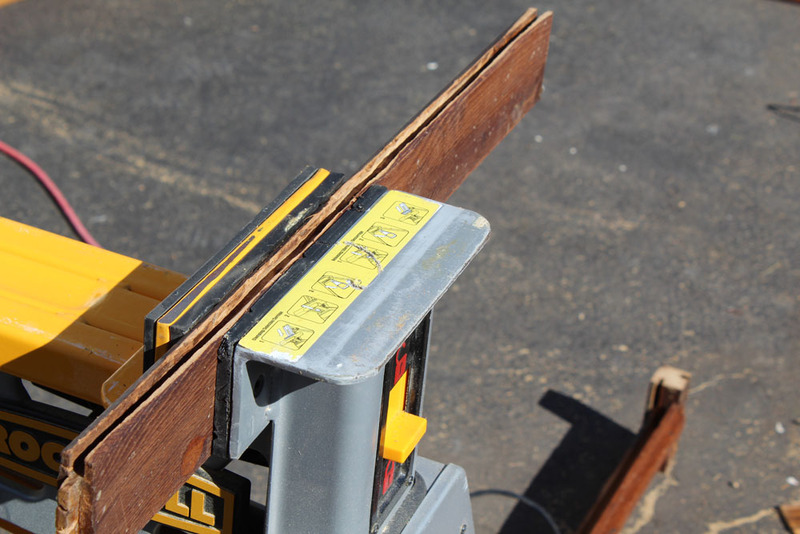 If you don’t have the space in your garage workshop to dedicate to certain bulky tools (like table saws and miter saws), then consider folding stands for them. My table saw came with a built in folding stand. 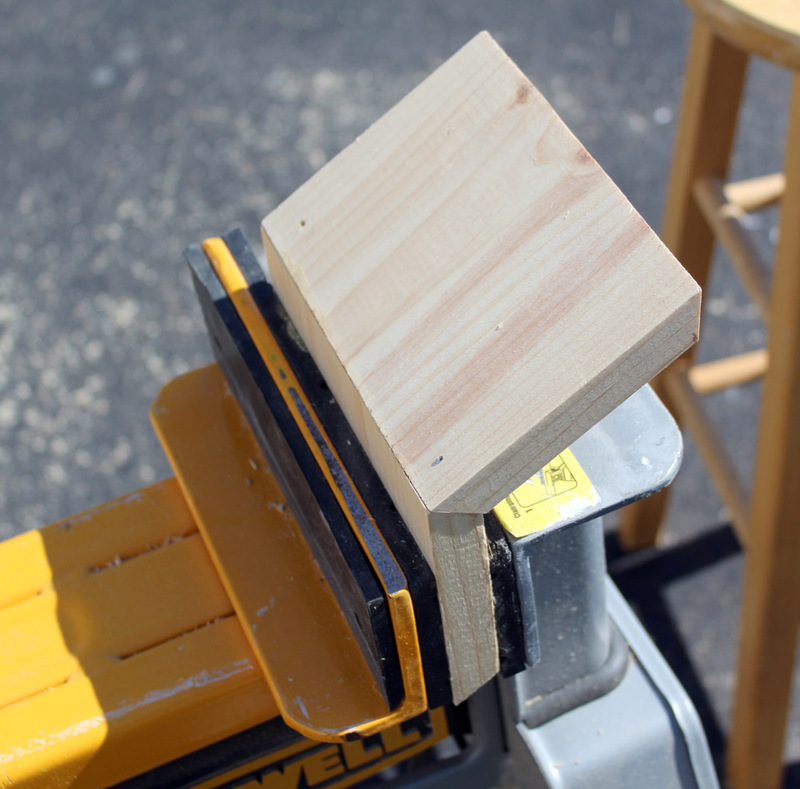 It allows me to fold up the saw and store it upright. It saves a considerable amount of space. The stand also makes it very portable. 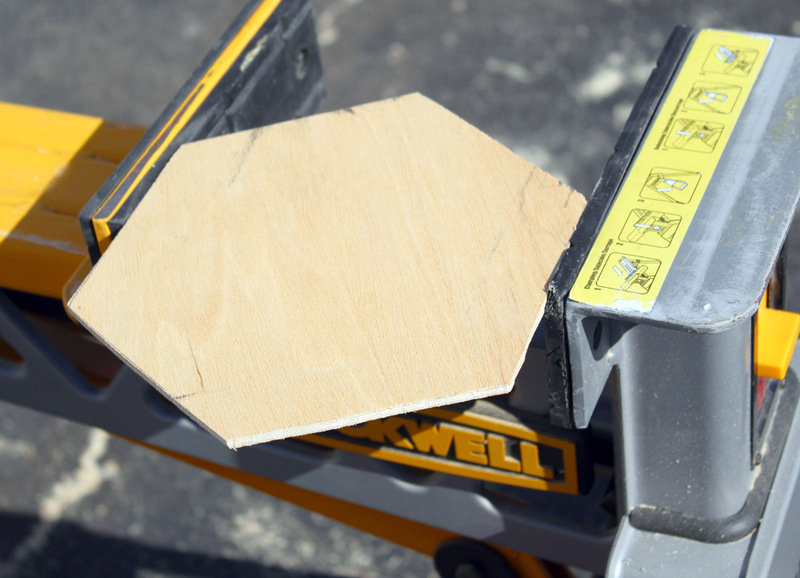 I can just wheel my table saw where ever I need to use it. 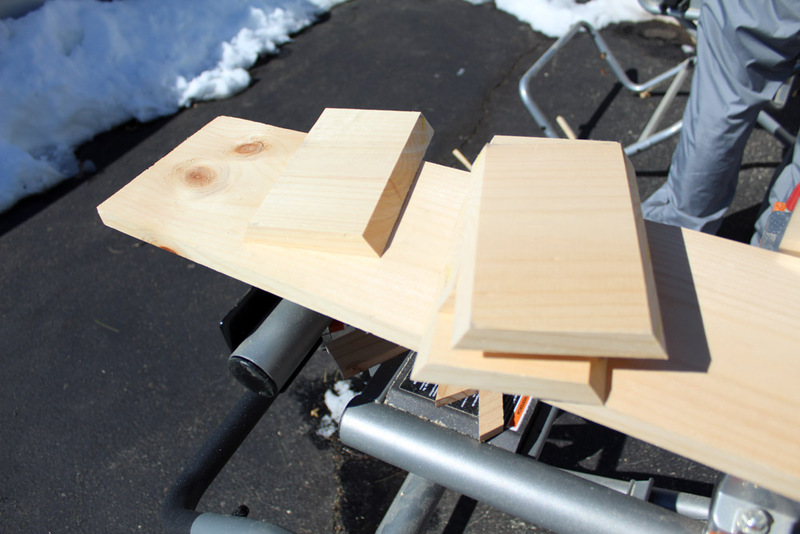 Similarly , I bought a folding stand for my miter saw. I get the same organization perks in the garage as my folding table saw. In addition, it comes with extending arms to help support long pieces of lumber I need to cut. Whenever I need to plug in a tool for power, I never have to wander too far for an outlet. 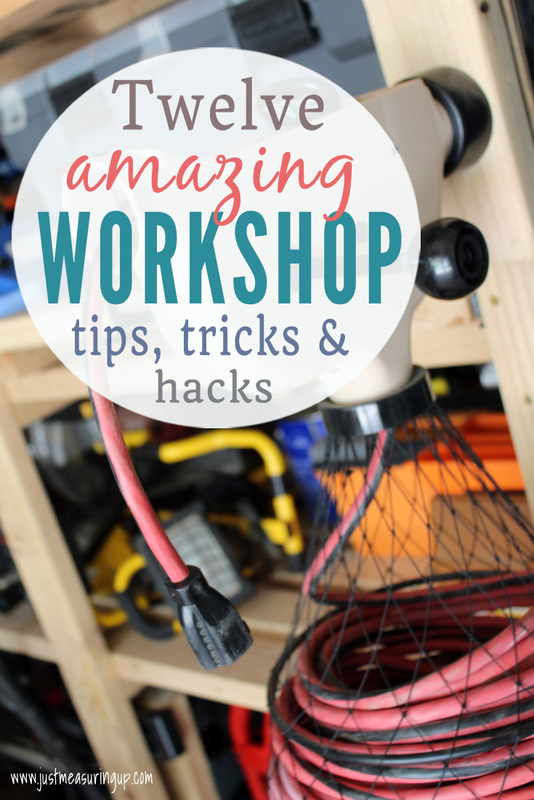 With this awesome extension cord holder, I just grab the cord and pull out however much I need. When I’m done, I crank the handle to reel the cord back in. 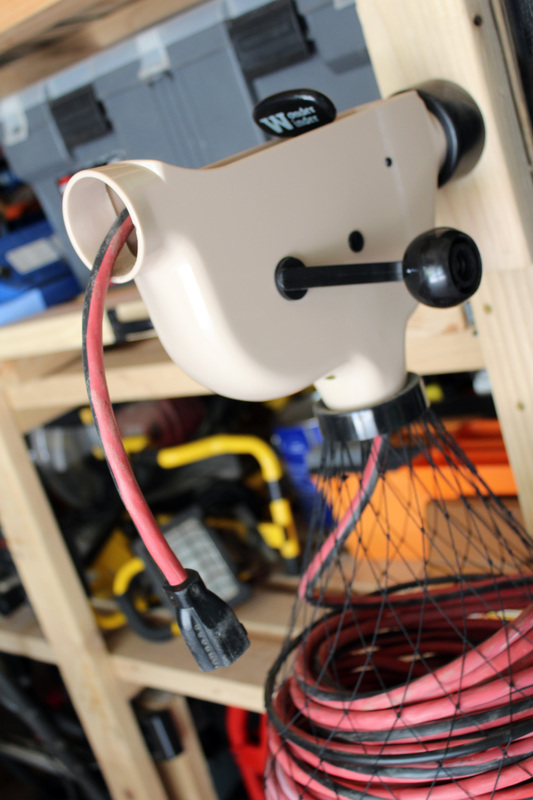 This extension cord holder is probably the most used contraption in my garage. To make it even more convenient, I mounted it on hinges so it can fold away when not being used. Here’s a really good tip. 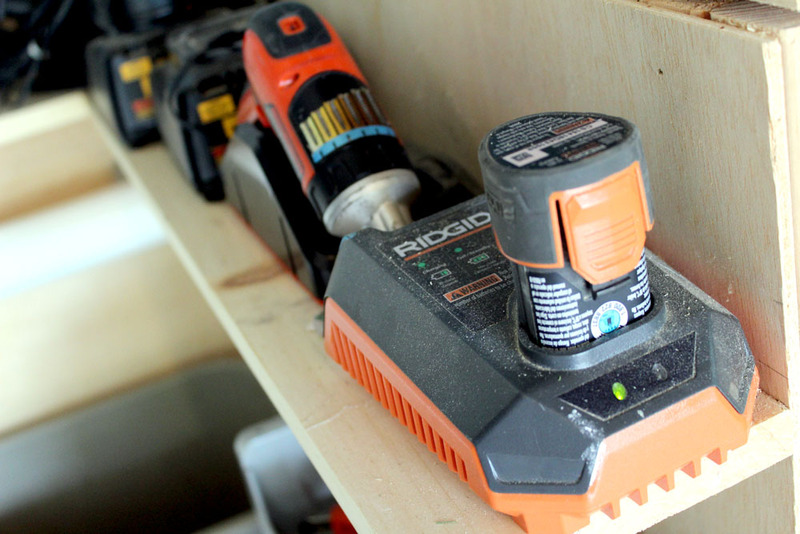 If you use a lot of power-hungry tools (like table saws, miter saws, or even large shop vacs), I highly recommend a pair of dedicated 20 amp outlets, on their own breaker. I hired an electrician to install this for me, but it was pretty cheap. I can’t tell you how many times I used to fire up my table saw just to trip the 15 amp family room breaker. My wife was not very happy sitting in the dark when previously she was just enjoying The Bachelor. Having a pair of outlets on their own breaker also means you can even run multiple high wattage tools simultaneously and never have to worry about making trips to reset breakers. 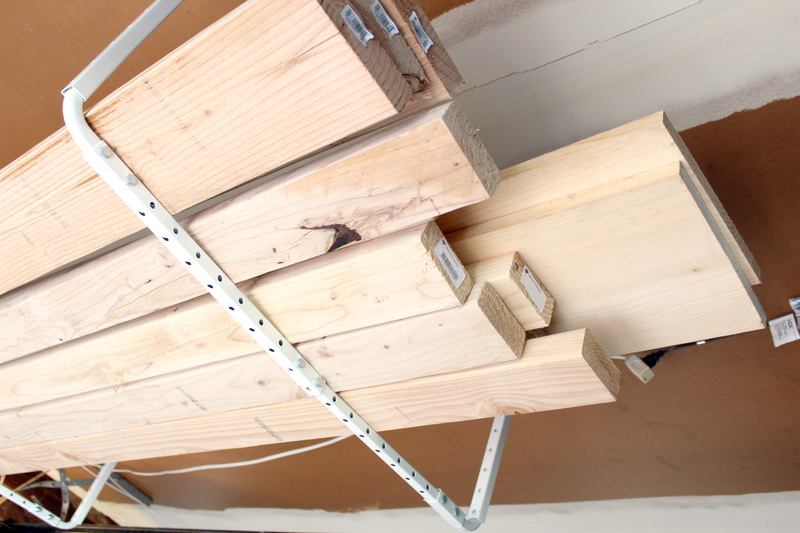 Your garage ceiling is prime real estate for storage. It’s completely out of the way, but there for you when you need it. So take full advantage of any free space up there. 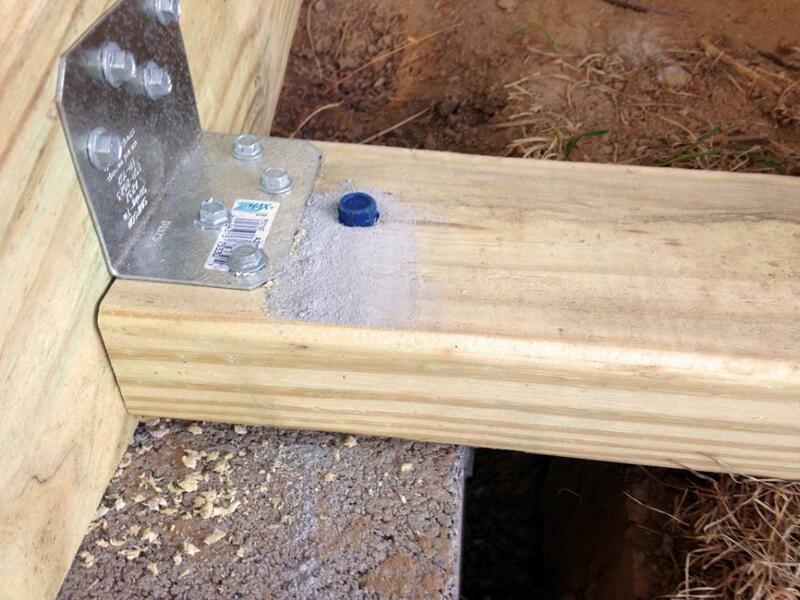 I’ve been using some heavy duty U bars bolted to my ceiling joists to store most of my lumber. I just grab a ladder or stepping tool when I need to access them. There’s a wide market of ceiling mounted storage accessories for you to check out. 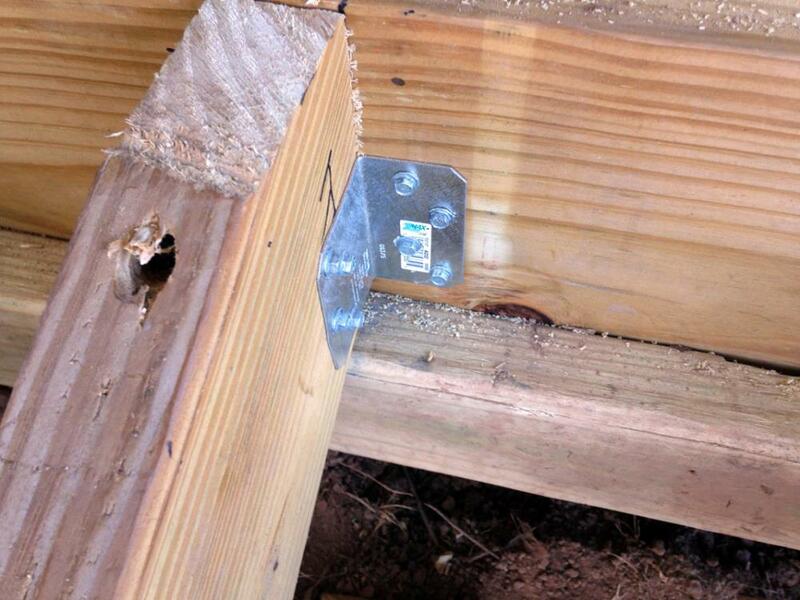 Just be weary of their load limits and make sure you attach them to ceiling joists with lag bolts. I recently picked up a handful of magnetic bars to store loose tools. They are an awesome organizational tool. I tacked them onto any free surface that made sense. I use the magnetic tool storage holders to store wrenches, screwdrivers, loose screws, basically anything that is made from metal. 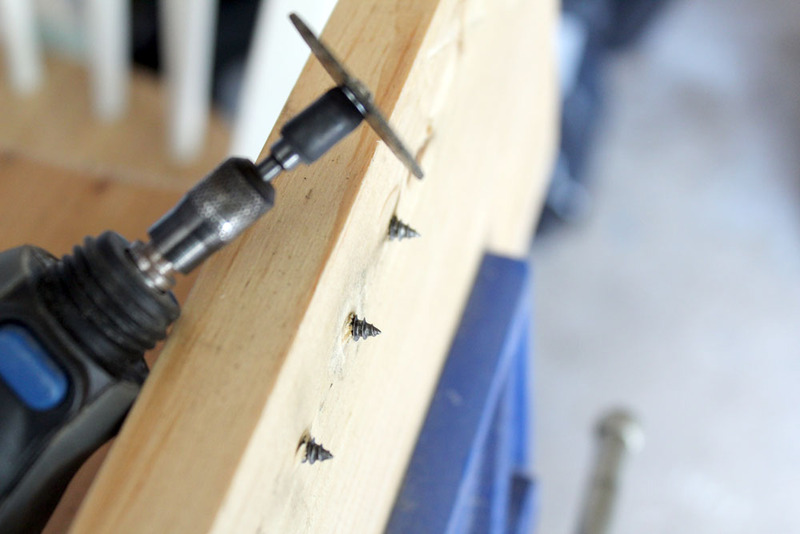 Magnetic bars make it so convenient to quickly grab a tool, then slap it back on the bar when done. And they are pretty cheap! 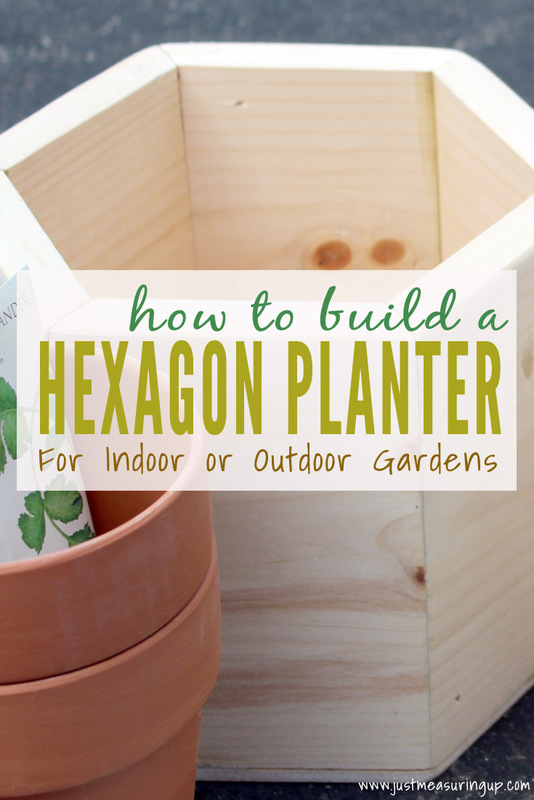 Not all DIY projects are full of bliss. There are times you will get frustrated. At the end of a hard day, you’ll probably want to let off some steam. That’s why I built a boxing speed bag platform in the middle of my garage workflow. It’s stowable too so it rises out of the way when not in use. It’s even secured to the ceiling with rubber dampeners to reduce the noise. 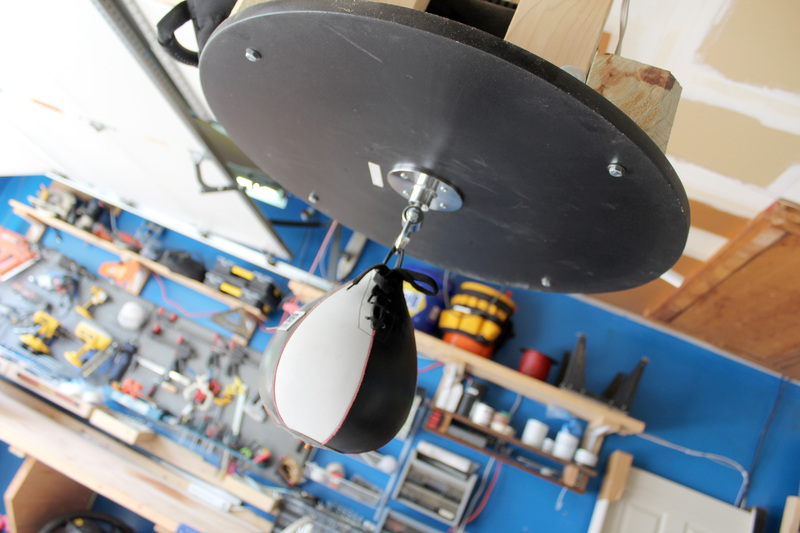 Check out my blog post for more details on my boxing speed bag platform. That’s it! I hope my list gives you some ideas for your own DIY garage storage and organization projects. Let me know what cool things you have in your garage, especially DIY garage storage ideas. 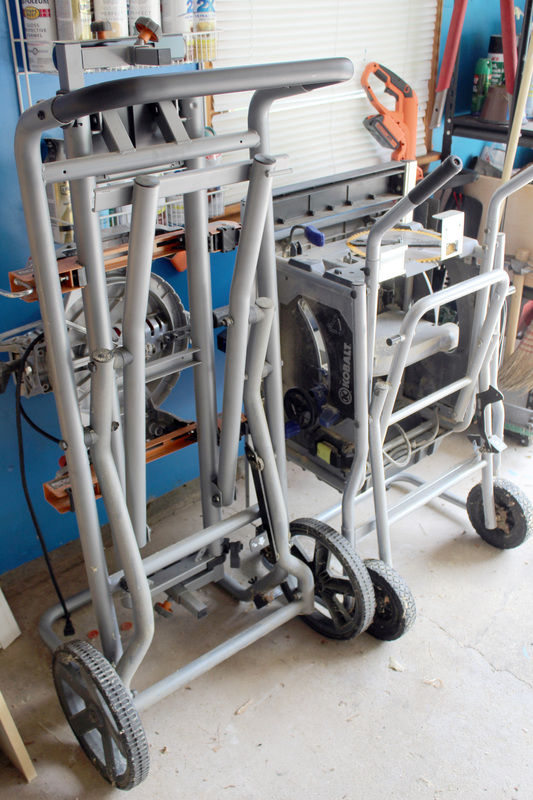 I’m always on the lookout for more things that can make my garage workshop time be more efficient and productive. Even though we moved into our home years ago, we still had way too many bare walls in our home. The walls were my last priority in getting ourselves unpacked and settled. So, picture frames sat in boxes in the garage for months and months. What I didn’t know in my procrastination was that I could have been using all that blank wall space to our advantage. Wall space isn’t just for pictures – it’s a gem of versatility! 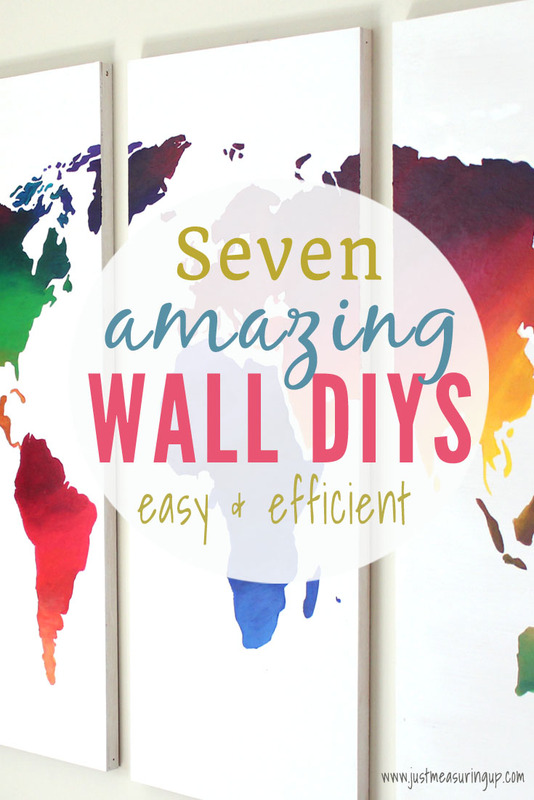 From floating shelves to accent walls to cool wall hangings to easy DIY wall art ideas, here are six easy DIYs for your walls so they will no longer be bare or boring. One of my favorite spots in our home is my craft room, which is just a sitting room off our bedroom. When we moved in, we had no idea what we were going to do with it. Ha! I’ve completely taken it over with craft supplies. When I had filled every inch, I moved to the walls. 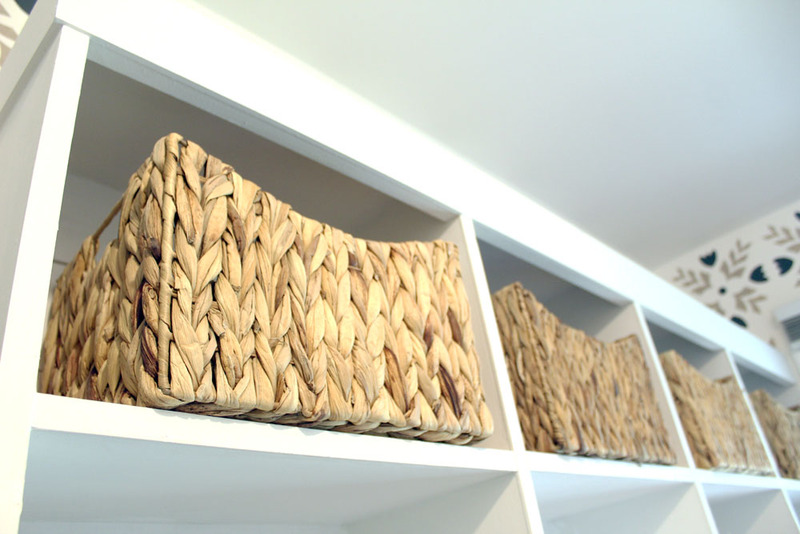 We built two simple shelves with the dimensions to fit four fabric storage bins on each. 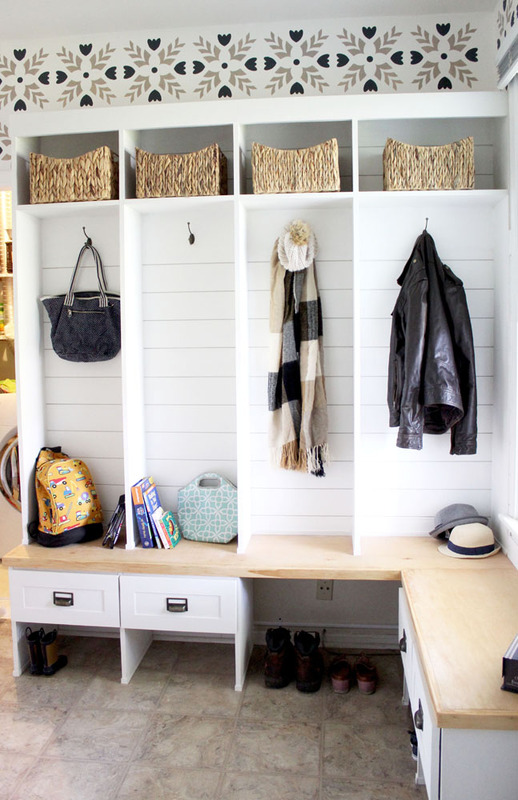 That’s eight storage bins – filled to the brim – and not taking up any closet or desk space! If you’re running out of space in your home, take a look at your empty walls, and see where you could put up a few storage shelves. It’s hard to find the perfect wall hanging to go over couches and beds because they need to be so big to look nice. And, art is expensive! So, why not DIY it? 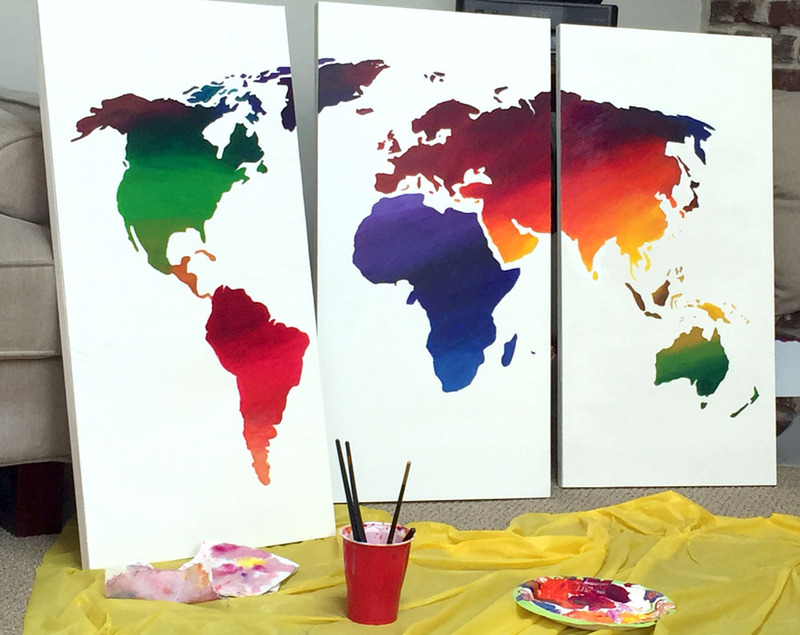 I partnered with Stencil Revolution to create this awesome stenciled world map wall hanging. They have really cool stencils, and they have more than half a dozen sizes for each stencil. 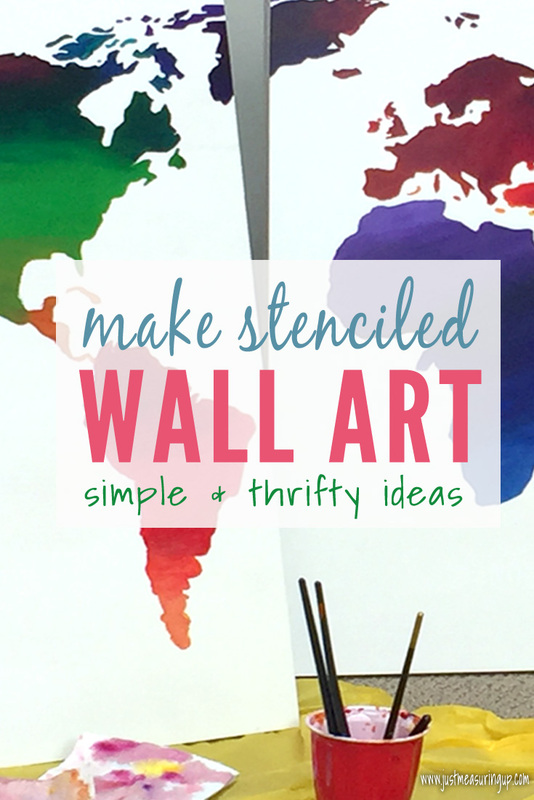 So you can paint a giant wall with a huge stencil or make a custom DIY piece like I did. To make this, I first measured the area above the couch in the craft room. 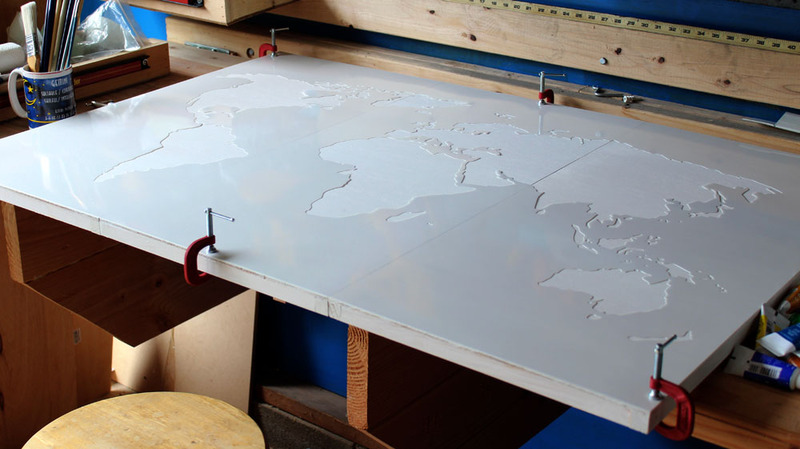 Then, I ordered the world map stencil size that was a little smaller. After that, I put together three wooden boxes, painted them white, and then used the world map stencil. As far as the paints, I used acrylic paint and faded one color into the next. Another way to create wall art is by making your own gallery wraps. Simply purchase a few canvases from the craft stores, and then find some wall decals that fit the theme of the room. Paint the canvases and then apply the wall decals. I painted some a solid blue and others striped. The striped ones added some extra flair. You could also use stencils on these gallery wraps too. These are great for nurseries or kids rooms. And, if the decals come up easily, you can swap out the decals for other ones as the kids grow up. 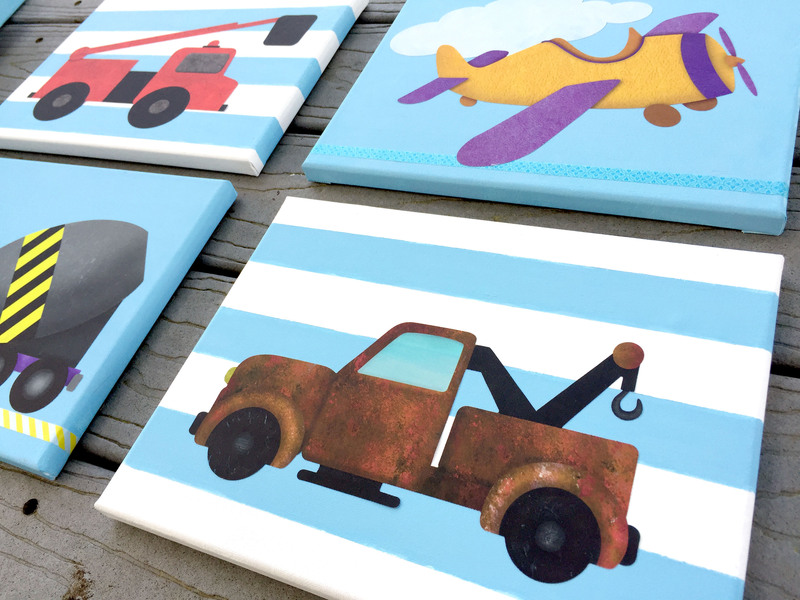 These canvases are definitely a go-to project for easy DIY wall art ideas. These picture ledges were free! Yes, you read that right 🙂 We made them out of scrap wood laying around the garage (I love a good scrap wood project) and painted them with paint we had on hand. The little ledge at the end is perfect for holding picture frames, and I emptied an entire box of frames. The picture frames perfectly took up the wall space in between two windows. 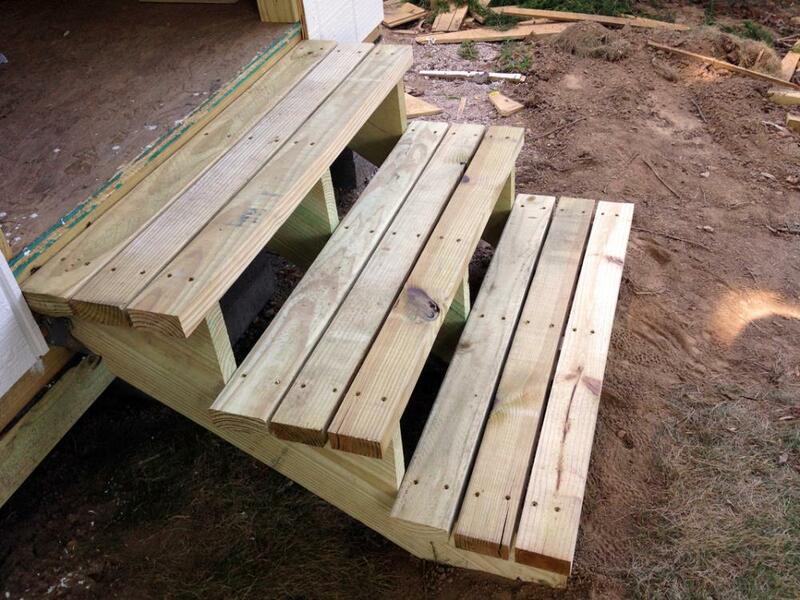 Not only were the ledges free, but it took just a few hours to put together. If you’re looking to make a gallery but can’t find enough frames that will compliment each other, use spray paint. 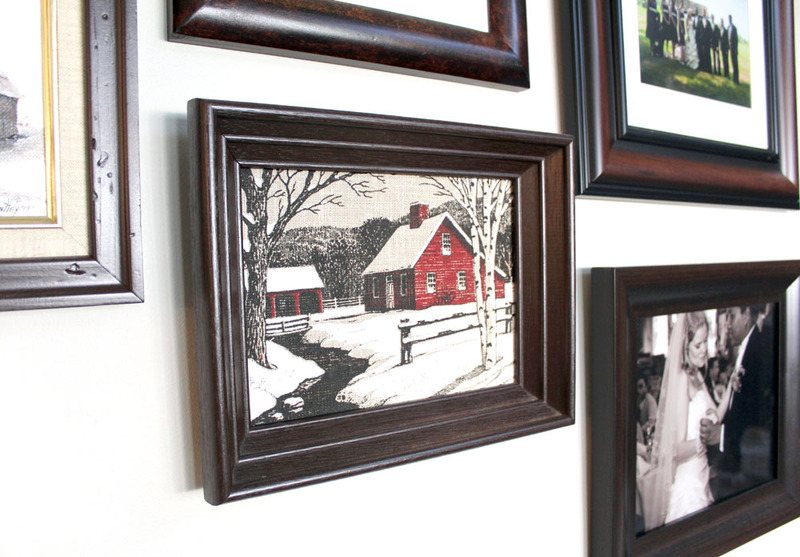 I had an entire gallery of brown wooden frames, but two of the embroidered pictures had frames that just didn’t go. With a little painter’s tape and some spray paint, the pictures now fit perfectly. Galleries are a fun way to hang pictures – especially in hallways or staircases. It can definitely add some character to these places. I love a gorgeous accent wall, and it’s an amazing way to bring character and flair to your space. There are so many ways to create an accent wall – you can wallpaper, you can stencil an accent wall, or you can paint – a whole wall one color or a simple striped wall. One of my favorite things about an accent wall is it saves you from painting the whole room – just updating one wall usually is enough. This is another of my favorite DIYs from my craft room. By installing pegboard, I was able to empty my entire desk. In fact, I got rid of my desk of drawers for a much simple table-desk design. I didn’t know if I would like the pegboard because I would have to put everything back always (something I’m not great at), but I LOVE it! It looks so cool, and I can see everything. Also, I don’t get asked questions by my husband and kids about where my scissors or markers are because everything is in plain sight. My son has a little spot on the edge, where he stores his markers and paint brushes too. 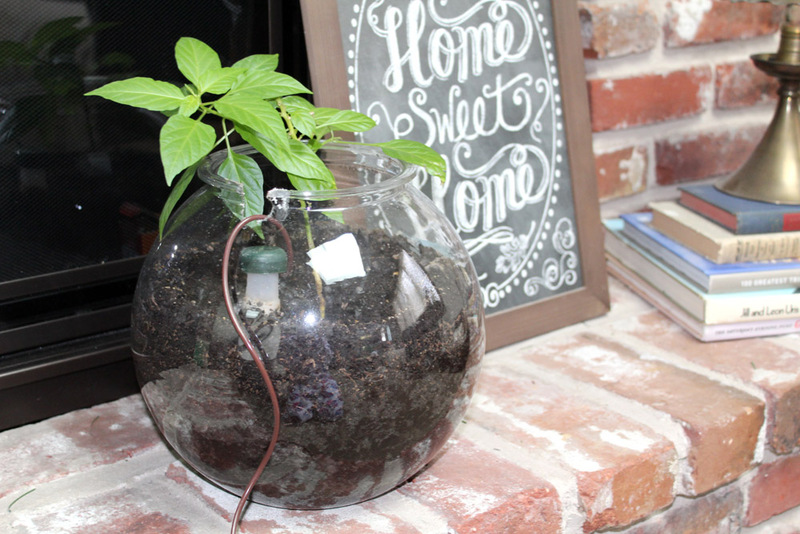 If you have overlooked wall space in your home, turn it into a fun DIY project. You can use wall space for storage – floating shelves, storage shelves, pegboard organization, or built-in cabinets. You can use the space for fun décor to add a little style in. You easily update or modernize your home with cool pictures or wall hangings with these easy DIY wall art ideas. 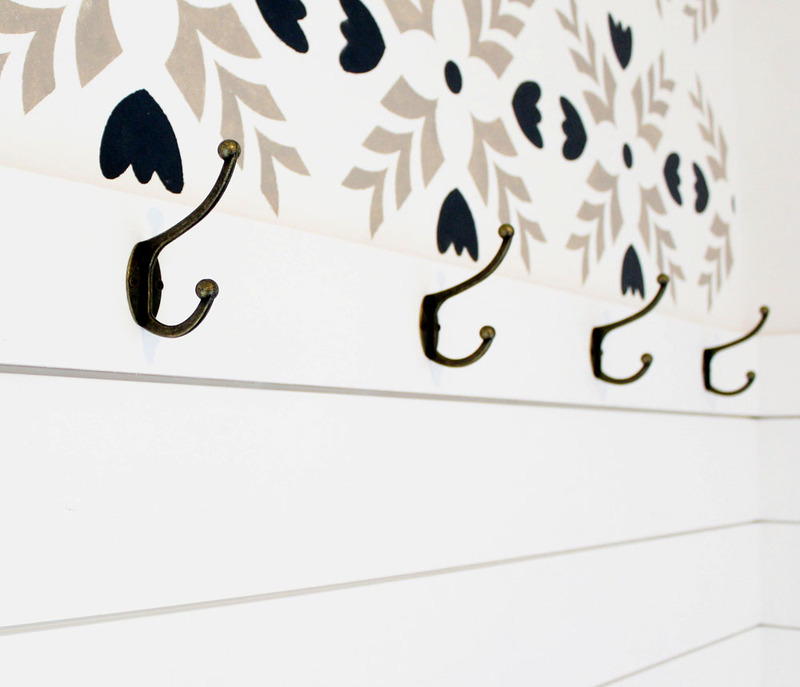 Wall space is undoubtedly a little gem that can be used in efficient or creative ways. 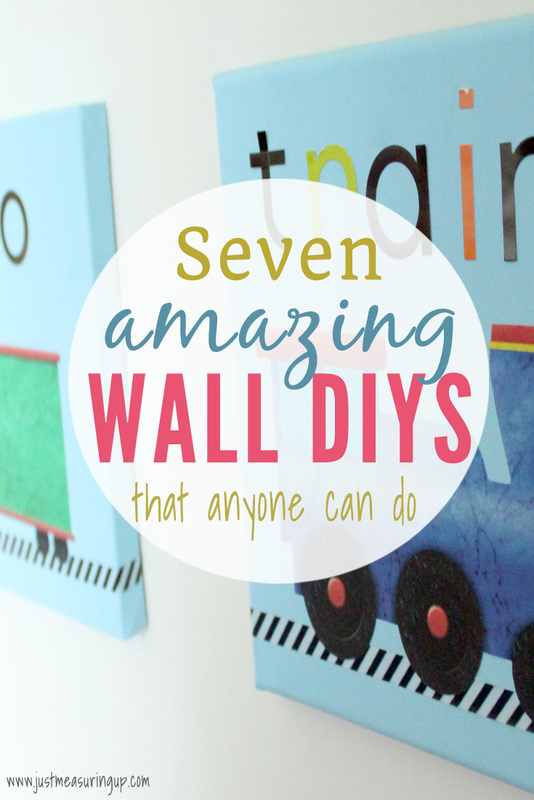 If you’re looking to add a little flair to your walls, definitely try one of the above DIYs. You’ll be loving your wall space in no time. 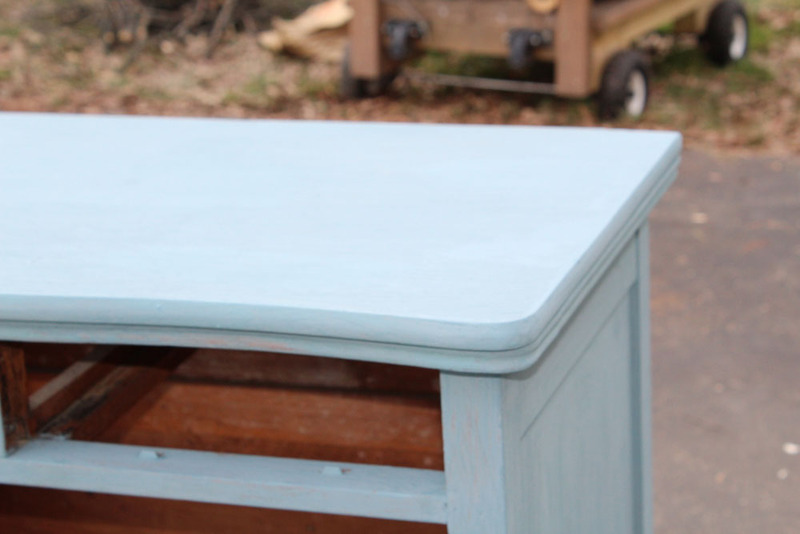 Learn how to use milk paint to refinish furniture with this easy tutorial. 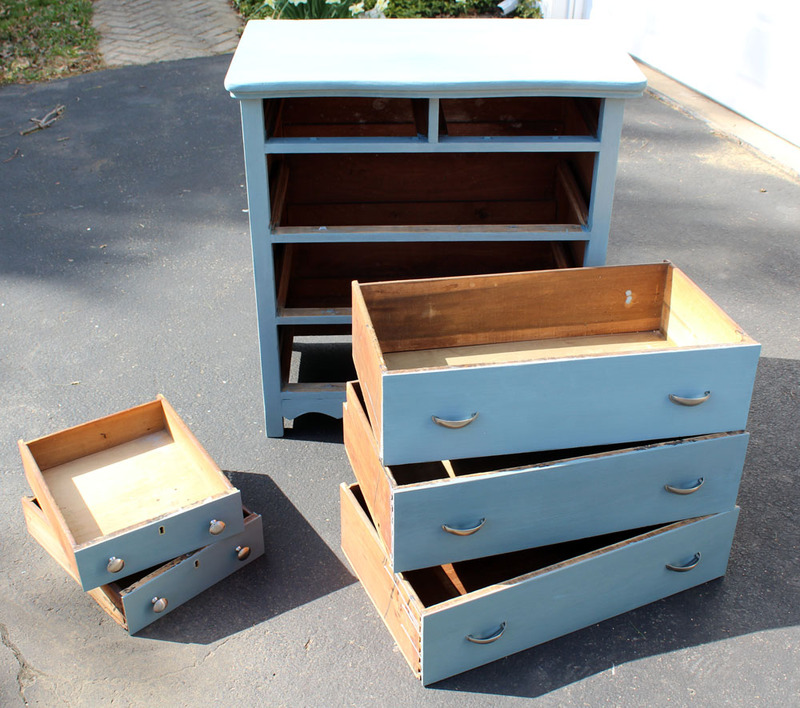 This amazing before and after shows just how easy and beautiful milk paint turns out. This post is sponsored by The Real Milk Paint Company. All opinions are entirely my own. Ever since I painted an old nightstand with chalk paint, I was hooked on using alternatives to regular latex paint. 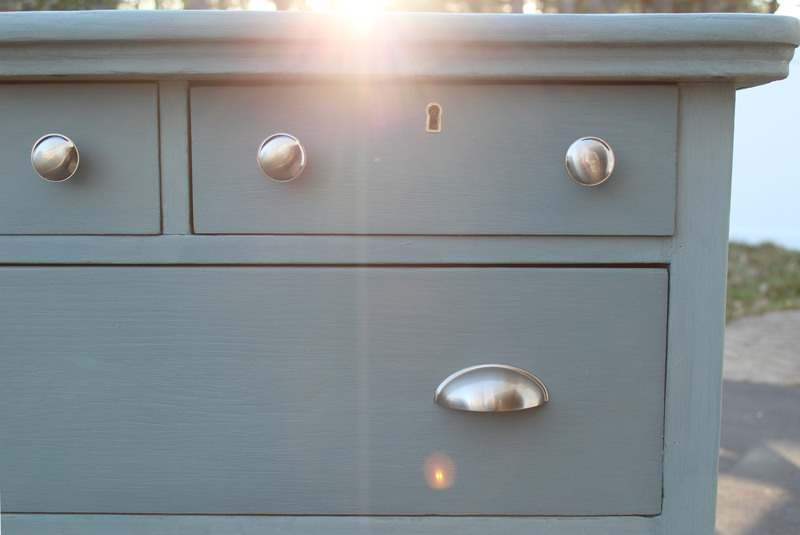 For me, chalk paint was one of the easiest ways to transform old furniture and the results were amazing. Since I had such a great experience with chalk paint, I had been wanting to work with milk paint. Yes, there is a difference between the two! 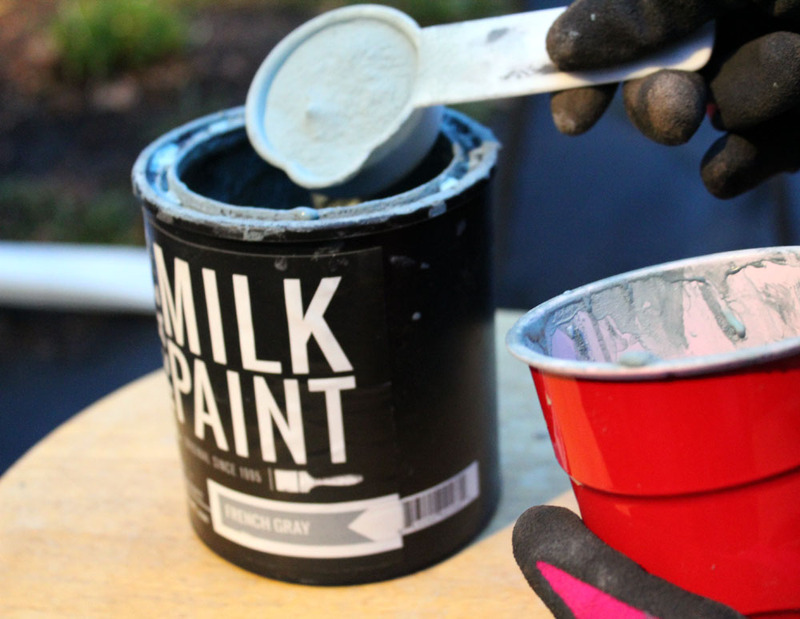 Milk paint comes in powder form, so you mix it with water. Milk paint is always non-toxic, which is a huge bonus. We have been moving toward having a more organic and natural lifestyle, and with our love for DIY, milk paint seemed like a natural next step for us. 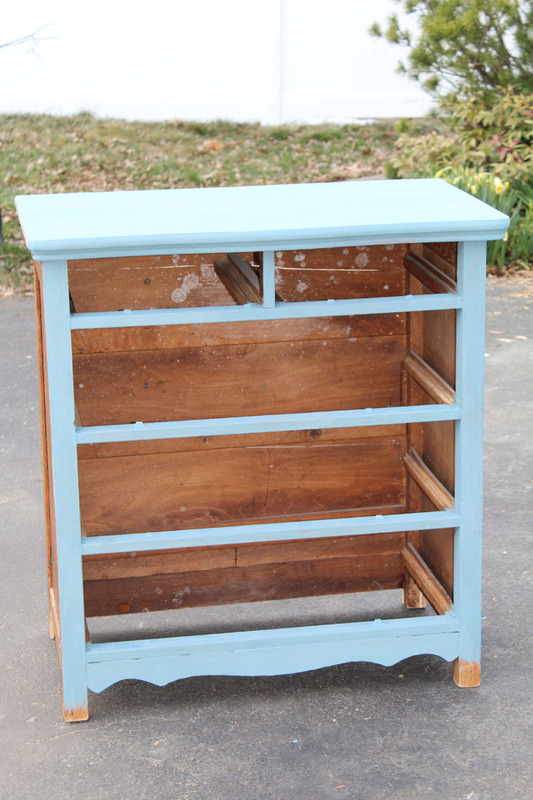 So, our first milk paint project was giving an old dresser a makeover. This dresser was given to us from my aunt and uncle and it easily dated back to the 1950s. My goal was to bring some new life into this old piece by using milk paint. The dresser was really tall, and I recently saw that you can run furniture through a tablesaw to shorten it! So, I gave my husband the challenge of shortening the dresser, thinking it would make for a less bulky piece. 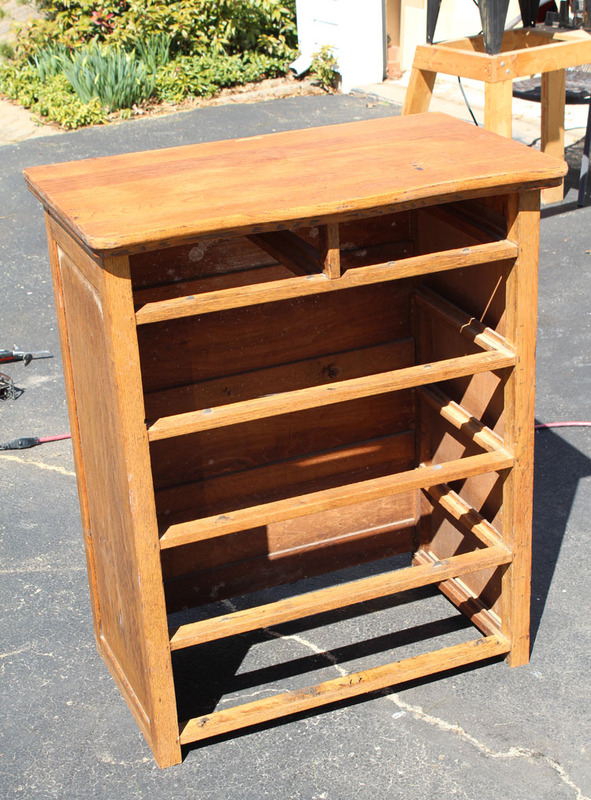 Below is the old dresser, in its original form. 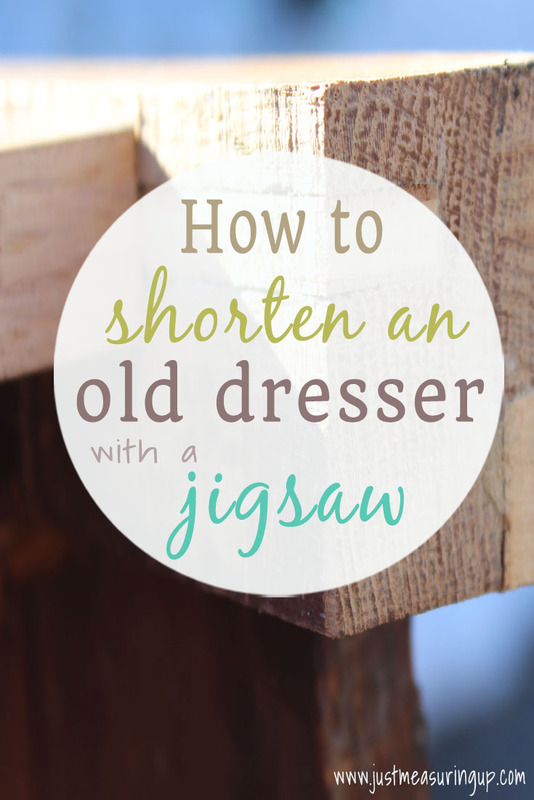 My husband accepted my challenge and transformed the tall dresser into a shorter one using a jigsaw (for those details check out how to shorten a tall dresser). 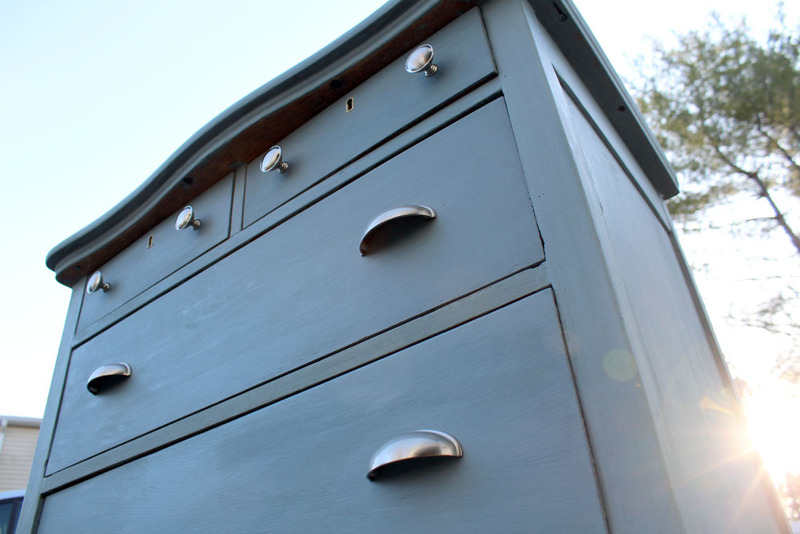 I was so thrilled with how the four drawer dresser looked and couldn’t wait to start refinishing it with milk paint. For a sneak preview of how the dresser turned out, check out the picture below. 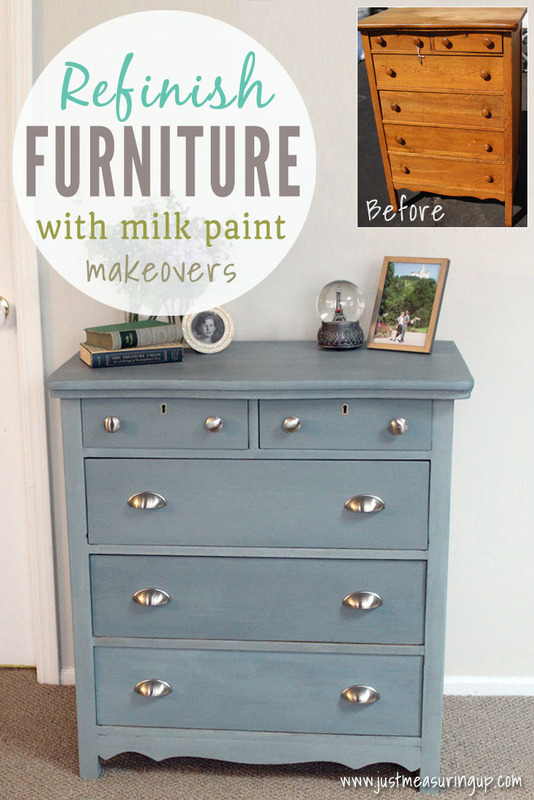 The milk paint completely transformed this old piece, and now I’m hooked on milk paint! 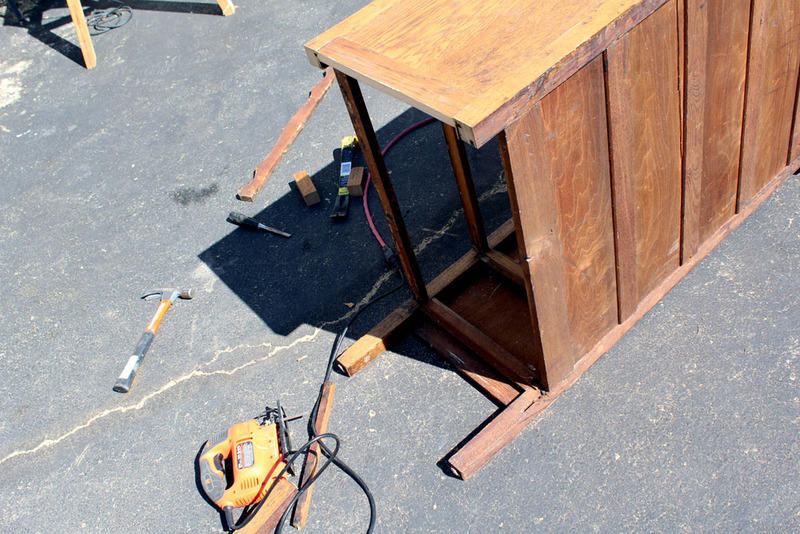 If you have an old piece of furniture that you’d like to redo, milk paint can completely make it over. 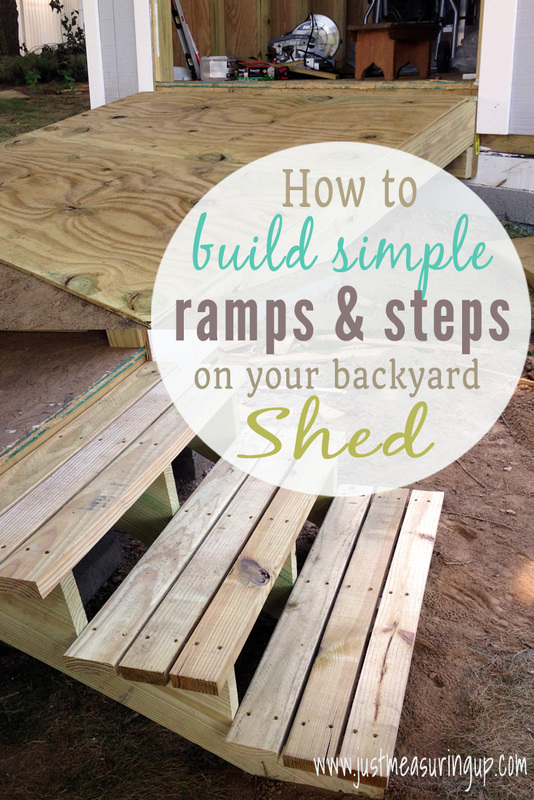 From choosing a paint to putting on new hardware, all the details are in this simple tutorial. When researching milk paints to use on furniture, I came across the Real Milk Paint Company and loved how natural the paint was. Their paint is entirely environmentally-friendly. 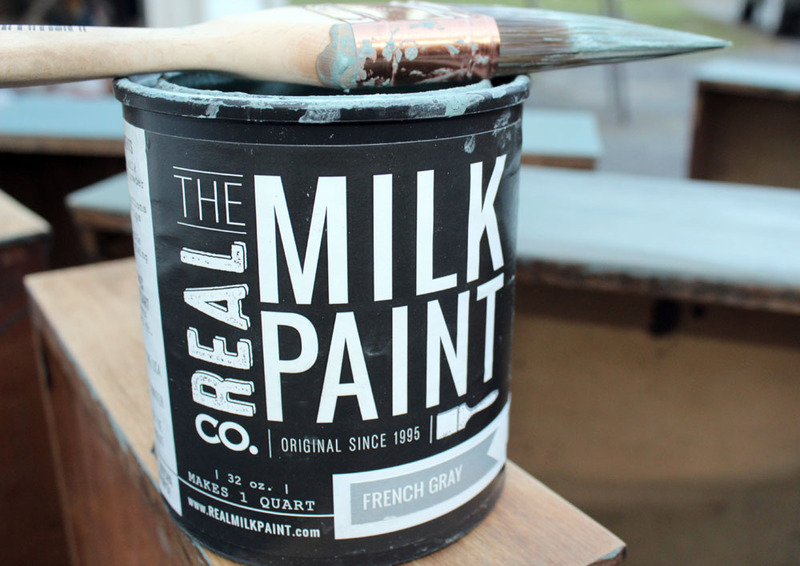 There’s absolutely no VOCs in the Real Milk Paint, and it is completely non-toxic. It’s made from iron oxide pigment, milk casein, and lime. 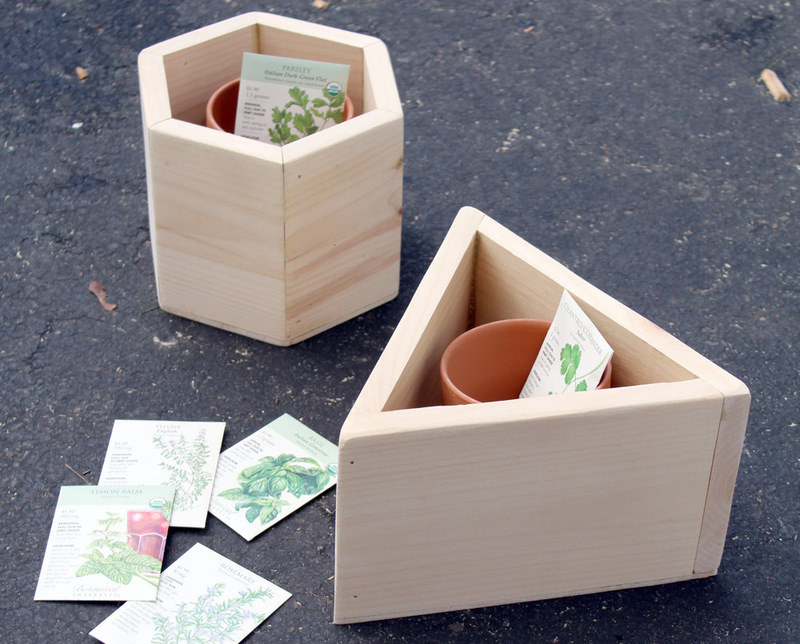 You can literally discard the paint in your garden. After reading all the benefits of the Real Milk Paint Company’s paint, I knew it was the perfect choice for my next DIY furniture transformation project. First, you want to clean your piece and remove any hardware. 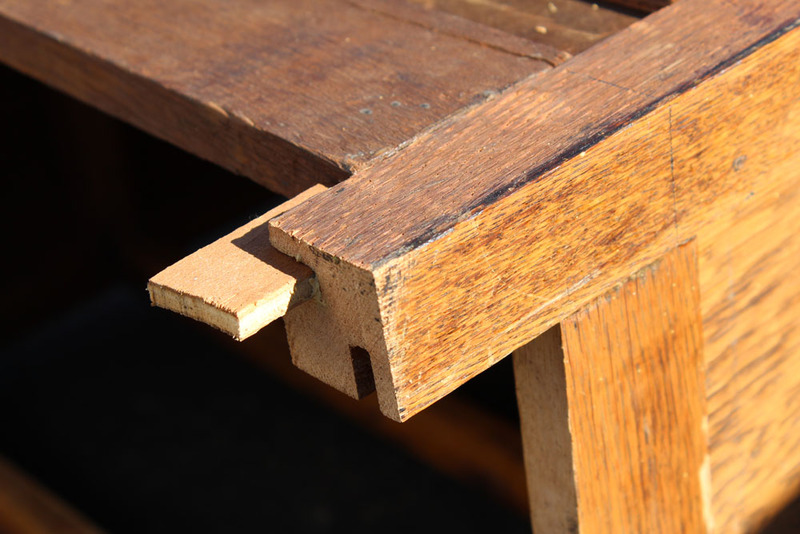 Sometimes your piece of furniture might be old, and the hardware might be difficult to remove. 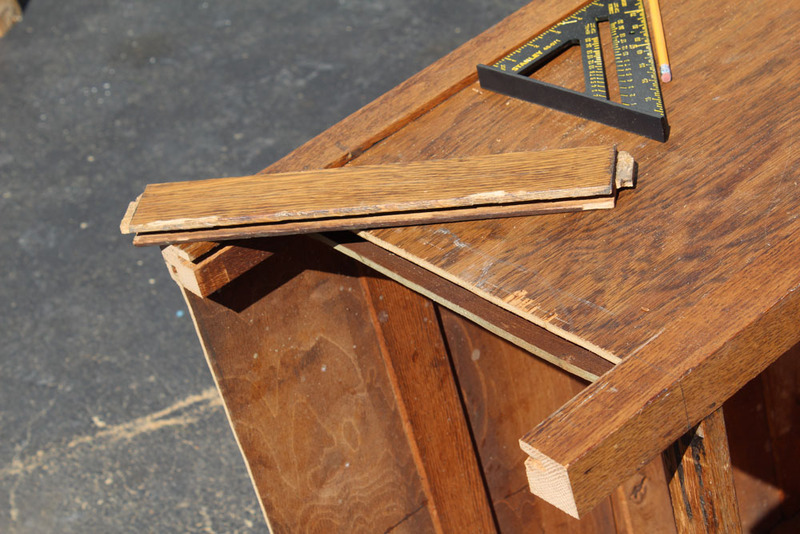 Ours was like this too, and we have a great tip in the a below section (How to Put New Knobs on a Dresser). You can use a bonding agent in your milk paint. 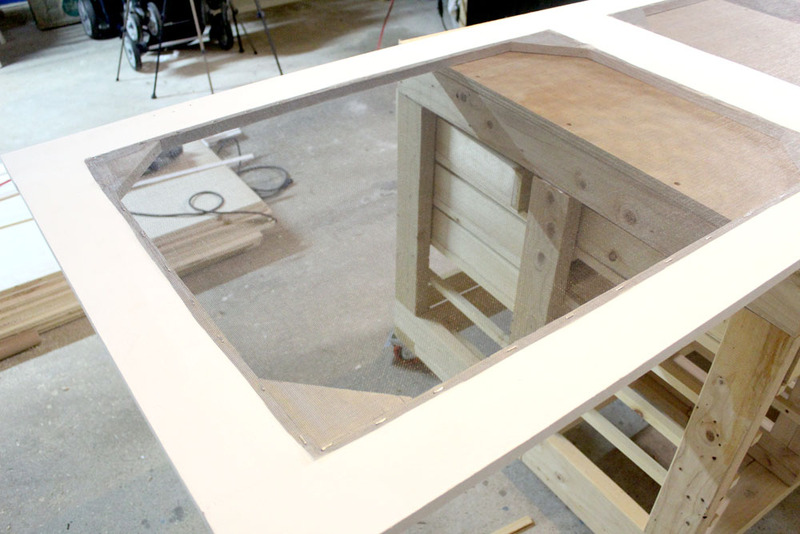 If you use a bonding agent in your milk paint, you eliminate the need to sand. 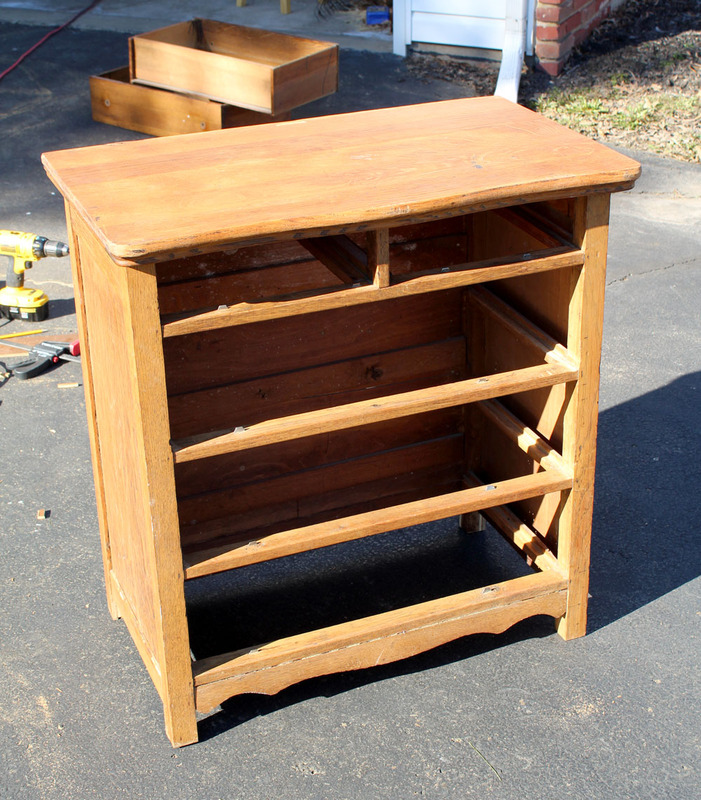 For this old dresser, we did a little bit of both to prepare the furniture for milk paint. We sanded down the top of the dresser to give it a fresh start, but we mixed the bonding agent in the paint for the rest of the dresser. You only need to mix in the bonding agent with the first coat. So, if you make another batch of paint for subsequent milk paint coats, you don’t need a bonding agent. 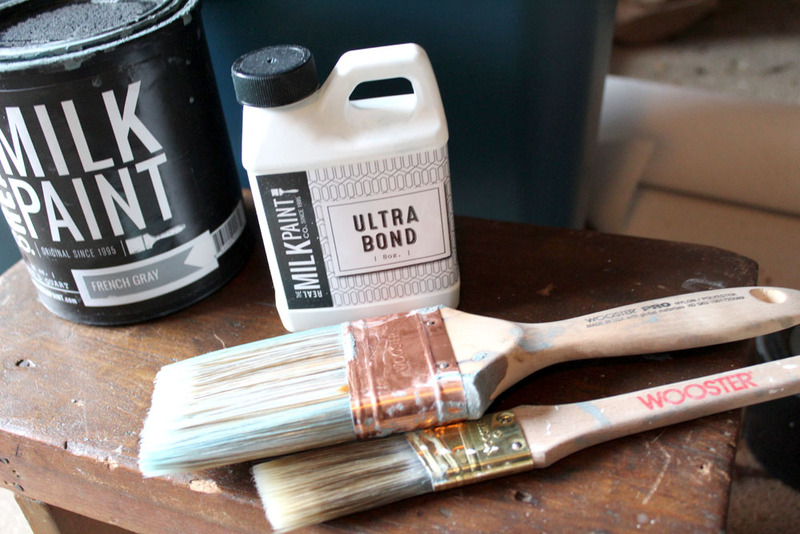 The Real Milk Paint Company has a product called Ultra Bond, which is really simple to just add into your mixed paint. 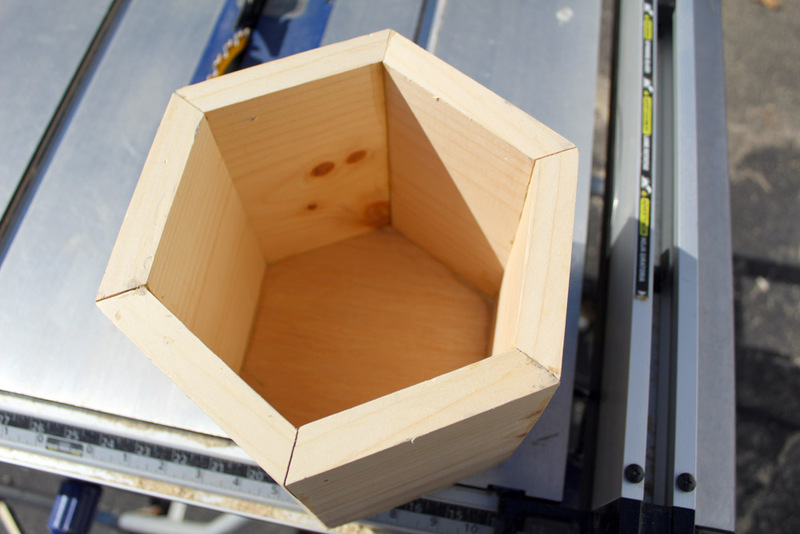 Then, you don’t have to sand your piece, which does save a lot of time. 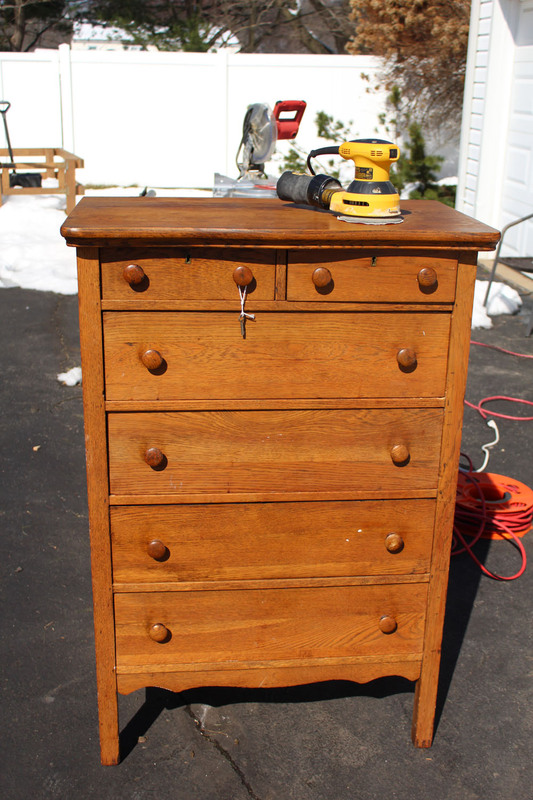 The following list of materials is what we used to transform this old dresser. I highly recommend getting a new high-quality bristle brush when working with milk paint, but more on that later. 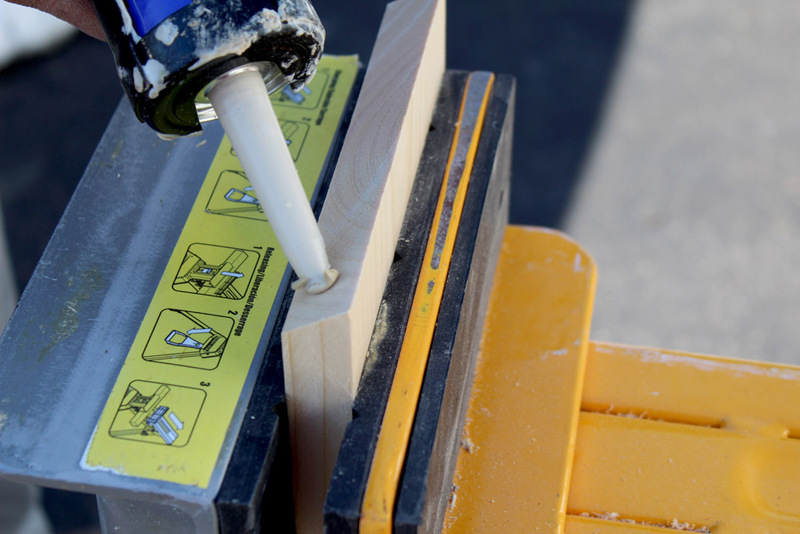 Ultra Bond – This is the bonding agent which eliminates the need to sand your furniture. Bristle paint brushes – This is a great brush set for milk painting. Measuring cup – I grabbed an old 1/4 cup from the kitchen. Cup for water – Plastic solo cups work well. Plastic spoons – These are helpful for dipping into the finishing cream and milk paint powder. New hardware – This is your preference but updating old hardware is such a great upgrade! And, I’m loving these half moon drawer pulls. Milk paint comes in a powder form. 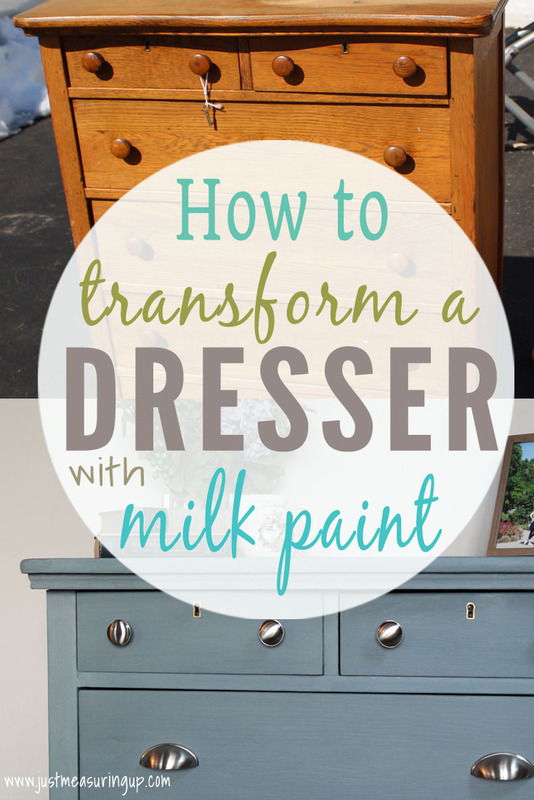 Don’t let this scare you though because mixing the milk paint couldn’t be easier! You definitely don’t need to be an artist or a even cook to be able to mix and measure your milk paint. It’s a one-to-one ratio, so the measuring is simple. And then you just shake, shake, shake. 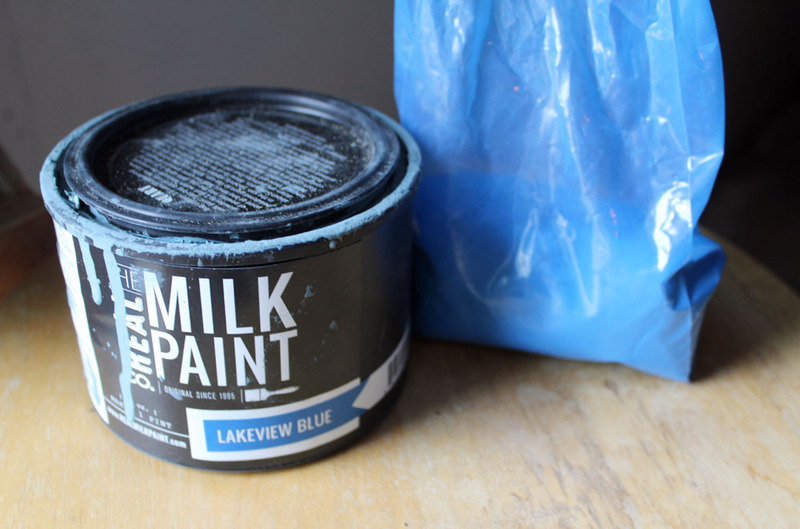 So I was mixing the Real Milk Paint Company’s French Gray with just a little bit of their Lakeview Blue. However, I LOVED the French Gray so much that I added very little of the Lakeview Blue in. To start, I grabbed a quarter cup from the kitchen and a few plastic spoons. I also filled a red solo cup with water. Out in the garage, I scooped out a quarter cup of the French Gray and dumped it in the paint can. Then I scooped one spoonful of Lakeview Blue and added it in. Then, I filled the quarter cup again with water and dumped this into the can. I also added one spoonful of water (to balance out the blue) and added that to the mix too. I closed the paint can and started shaking it up. You’ll hear the marble that comes with the can bouncing around. This helps to mix the paint up. After giving it a really good shake, let it sit for 20 minutes. After that, if any clumps come to the surface, simply shake it up again. Milk Paint Mixing Tip: If you are going to mix colors, make sure to write down exactly what you mixed so that you can create the same color again. As tempted as you will be to start painting, it’s best to test your color first. You want to make sure the color dries the way you like it. So, pick a small little area and give the color a little while to dry to make sure you like it. The French Gray and Lakeview Blue mix that I conjured up was more powder blue than charcoal blue, so I decided that when I made another batch, that I would use a smaller amount of Lakeview Blue. 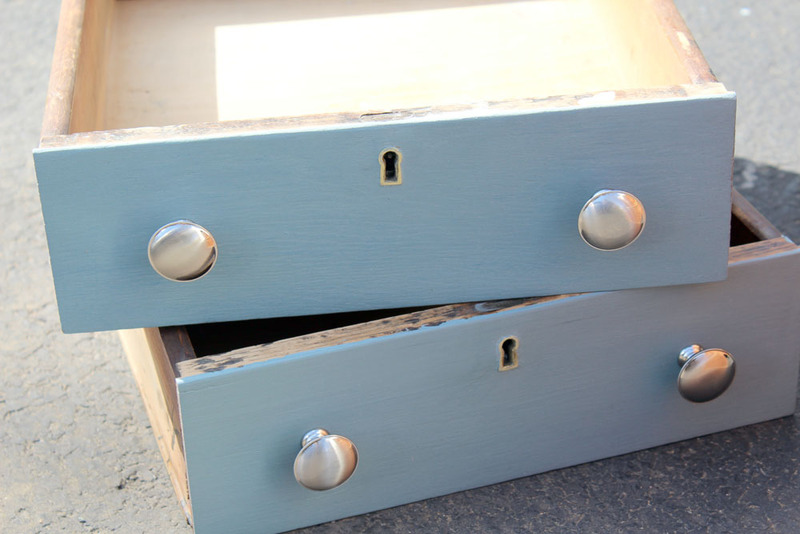 This was one of my favorite parts of painting with milk paint – you make your own color! Of course, there are base colors to start with, and then you can add other colors in to achieve the look you want. With regular latex paint, I can’t tell you how many times I’ve taken a can of paint back because it wasn’t exactly what I had in mind. With milk paint, you eliminate all that by making your own color. Okay, I simply cannot stress this enough, but you need to use a really, really good paintbrush with milk paint. You might not want to go digging in your bucket of brushes and instead just buy a couple really nice ones. 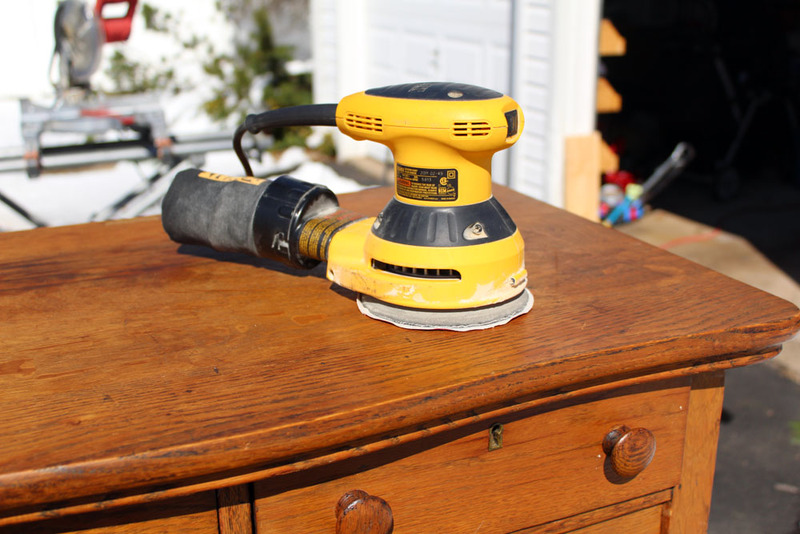 You’ll thank yourself later when you love your refinished piece. If you use a poor paintbrush, you’ll end up with lots of streaks and uneven surfaces. But a smooth bristle brush will give your surface a really nice look. So, back to painting. 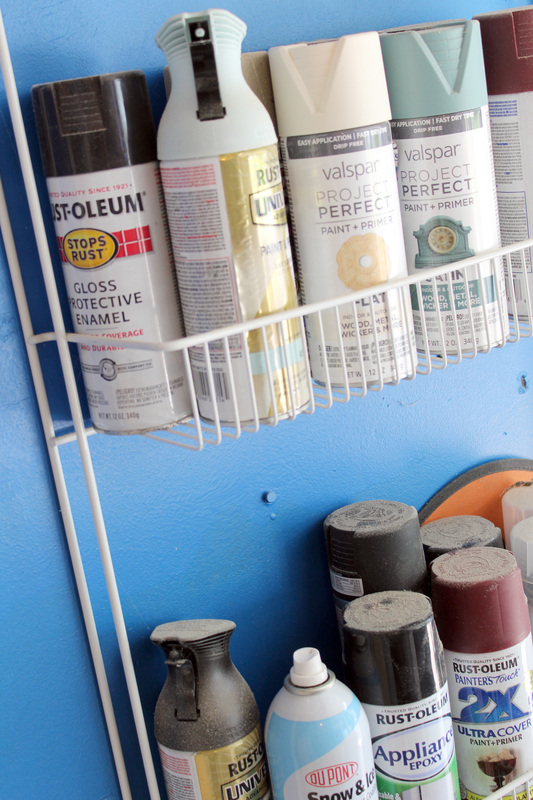 Now that your paint is mixed and you’re happy with the color, it’s time to get started. I would choose a small area to start in, so that you get used to the milk paint on a smaller surface. Rather than jumping right into the top of the dresser, I started on a drawer. Starting on a drawer gave me a smaller area to work on so that I could perfect my milk painting technique. As you’re painting, keep your water cup near your paint can, because depending on how thick your mix is or what coat of paint you are working on, you might need to add some water. Milk paint has a different consistency than regular paint and a different consistency than chalk paint. It’s not as smooth as either of those. It can be watery, thick, or can even clump together. Light Coats – The trick is you want to give your furniture light coats. Don’t clump on thick layers of paint because milk paint doesn’t work this way. Paint will start to build up in places and start to crack. Light coats are key. 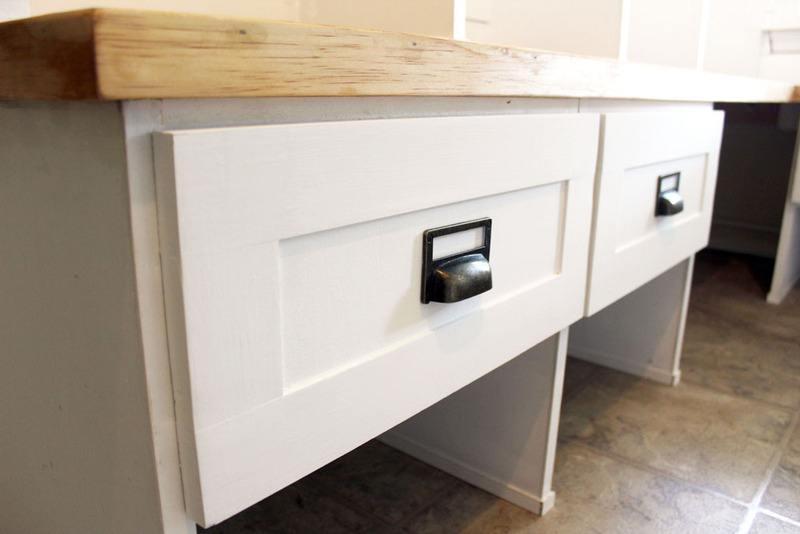 The milk paint might look streaky because you’ll see the wood coming through, but that’s okay. Another coat or two of milk paint will even it out. 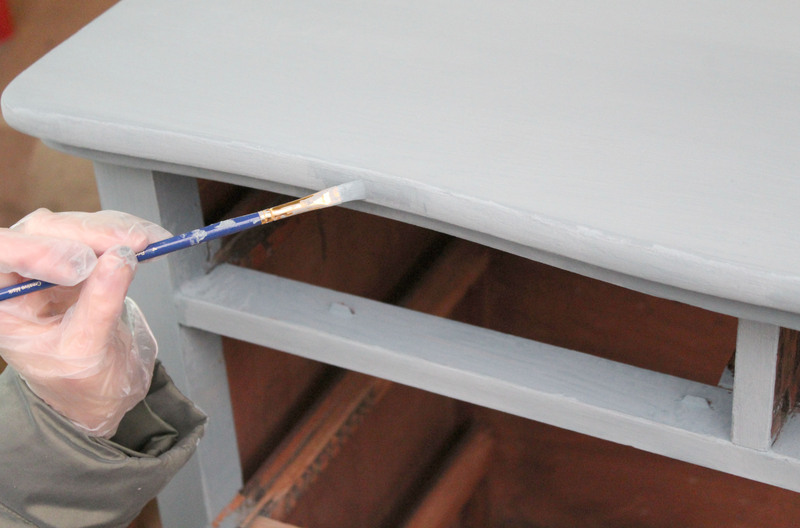 Even Brushing – Another tip is that milk paint usually dries the way you are painting it on. So, you want to make sure you are running your brush from one end of the piece to the other, so you don’t have brush strokes on your piece. f you’re seeing brush strokes when you paint, you will see these when it dries. Adding Water – If you’re painting and the milk paint seems too thick and it isn’t spreading well, then dip the very, very edges of your brush into your water cup. A little water goes a long way. Then attempt to spread the paint. You also might do this with a second or third coat to help the paint spread better. Now, if your paint becomes bubbly, you have too much water. Keep going over the bubbles with the brush, until they are completely gone. Getting into a Rhythm – I think the best tip I could give you is to just work with the paint, and the more you work with it, the more you’ll find a good consistency and technique for you. As you start painting, you’ll start to get into a rhythm and notice what works well for you. Just to back track, after painting a test spot with milk paint, I went on to paint a drawer. I was happy with that, so I continued onto painting the rest of the drawers. After the drawers, I was comfortable with my consistency and I moved onto painting the top of the dresser. It took me a little while to paint the top of the dresser with milk paint. I started in small areas, like I mentioned above and continued to keep smoothing out the milk paint. I didn’t do the rounded sides of top quite yet because the milk paint dried so fast – that I was spending all the time getting the top to look perfect. 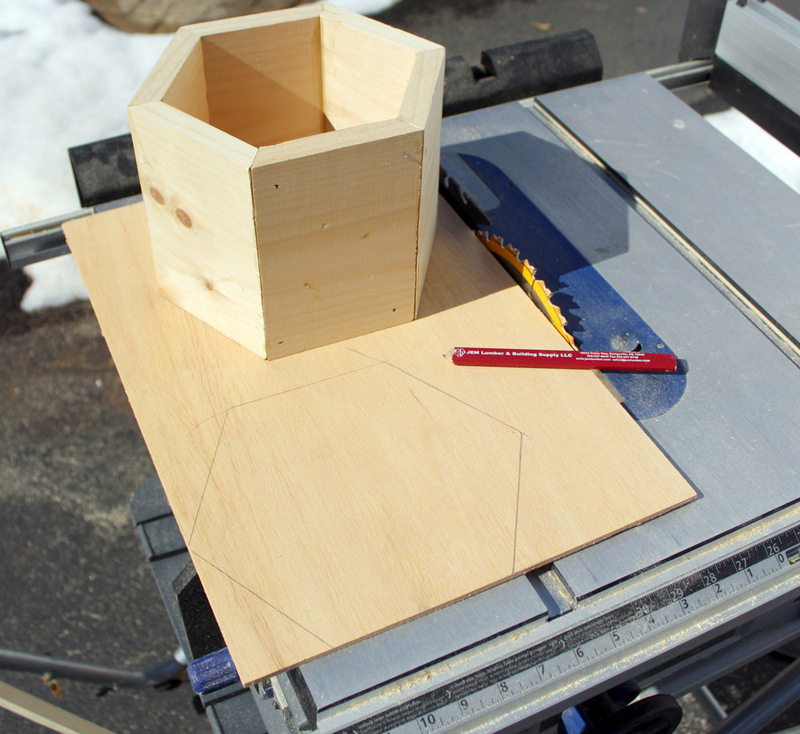 After I was pleased with the top, I moved onto the front of the dresser and the rounded sides. For the rounded sides, I wanted to paint these with precision. I needed to be careful not to get any paint on the dresser top – since I had already painted that and it had dried. For the rounded sides of the dresser top, I used a small brush from my craft room. Pictured below is the whole dresser after one coat of milk paint. It was a little more blue than I wanted, so the next coat I mixed up, I used just a half spoonful of Lakeview Blue. And, the third coat of milk paint, I used all French Gray. 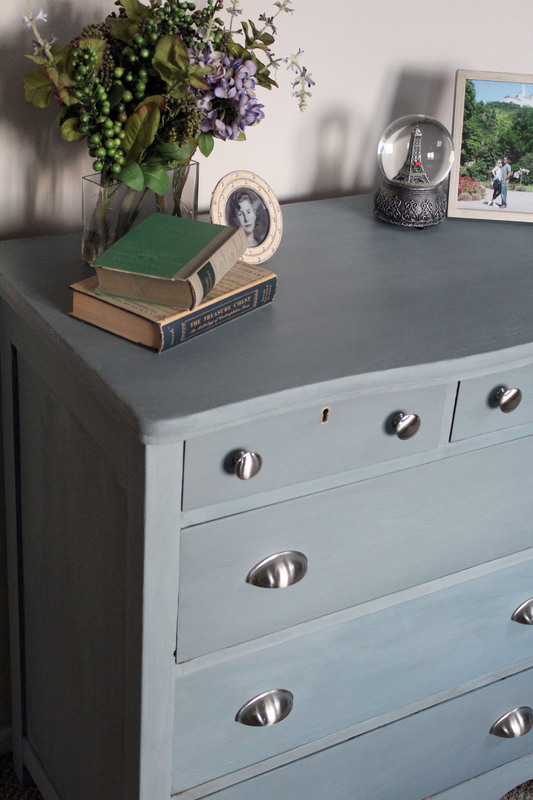 The picture below is after the first coat – so the dresser was looking quite blue. I continued on to paint two really good coats of milk paint on the entire dresser, and then a third light topcoat. Milk paint dries super fast, so you can knock out a milk painting project in a short amount of time. Paint a coat, head inside for a snack, and by the time you’re done that snack, you can probably do another coat. That’s why milk painting is a great naptime project for mommas! 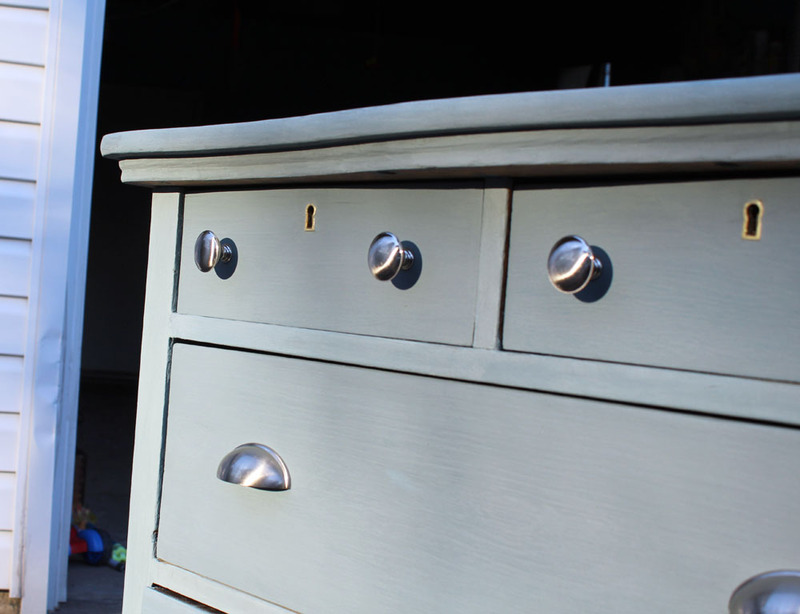 Applying the finish to the milk paint dresser couldn’t have been easier. Once the milk paint furniture is dry, you can apply your finish. 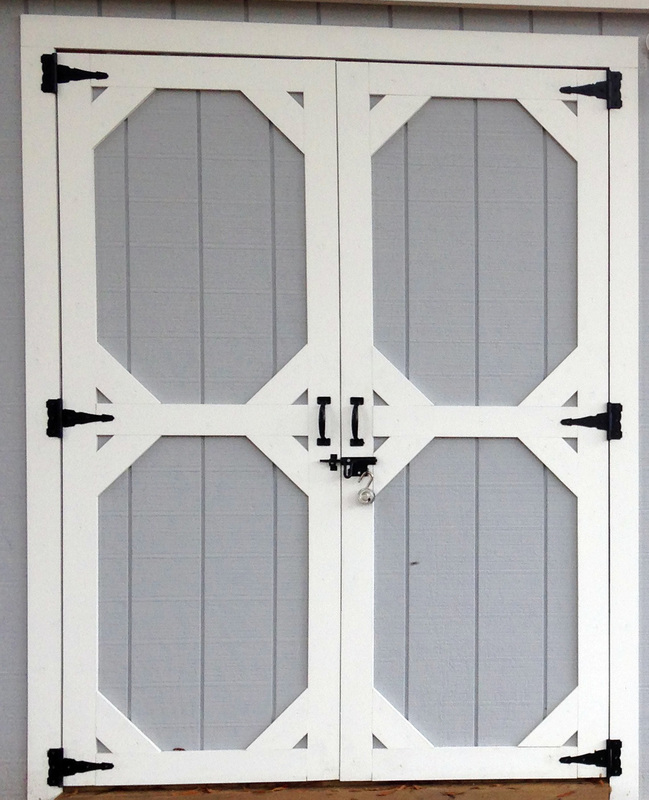 We used the low sheen finishing cream from The Real Milk Paint Company. I simply scooped a dollop out with a spoon and then used an old sock to rub it all over the dresser. You use enough of it to cover your area. It was super easy. The finishing cream is non-toxic – and doesn’t have any kind of smell. Only one coat was necessary too! 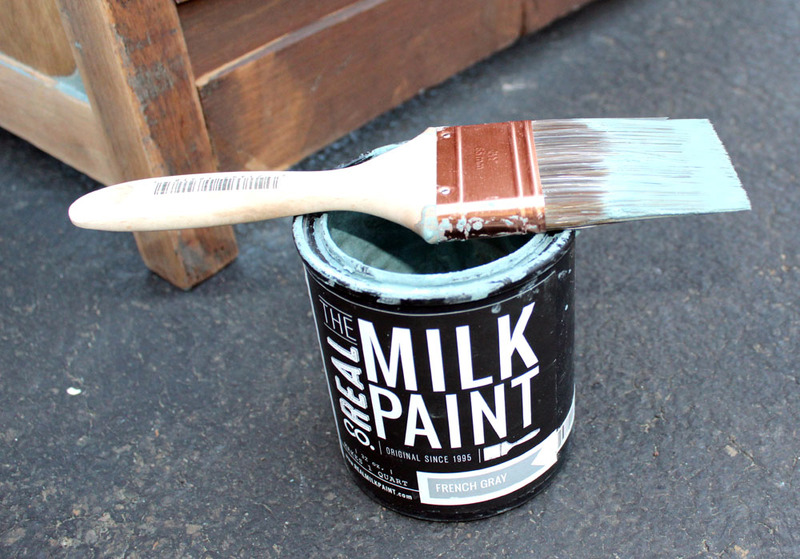 Milk Paint Finishing Tip: Some of the milk paint pigment might rub off on your cloth. This is normal. If your piece of furniture is more than one color then you might want to use a separate cloth for each milk painted color you are applying the finish to. Part of the upgrade that we were giving the dresser was new hardware. I loveee adding new hardware to old pieces because it is an instant upgrade. Prior to painting, when I removed the original hardware, I had a little trouble removing a few of the old knobs. Some of the screw heads started to strip with my screwdriver because of the age, so I used my impact driver to easily remove them with no damage. In putting the new knobs on the dresser, I decided to use round knobs on the top small drawers and half moon shell knobs on the rest of the drawers. This made the two smaller drawers the easiest to upgrade as it was just a matter of swapping the old knobs with the new ones. 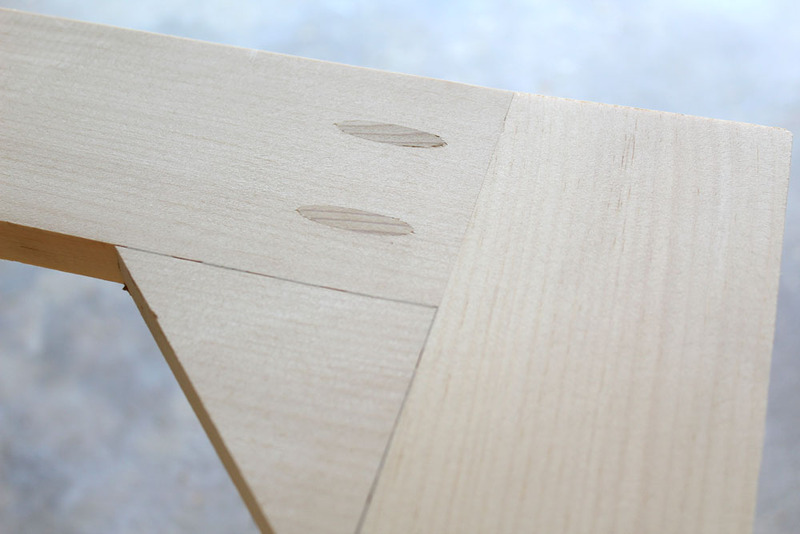 The larger drawers needed some additional holes drilled to accommodate the half moon shell drawer pulls. I used a ruler to line up the existing holes. My husband helped me out with this since my kids’ naptimes had ended. 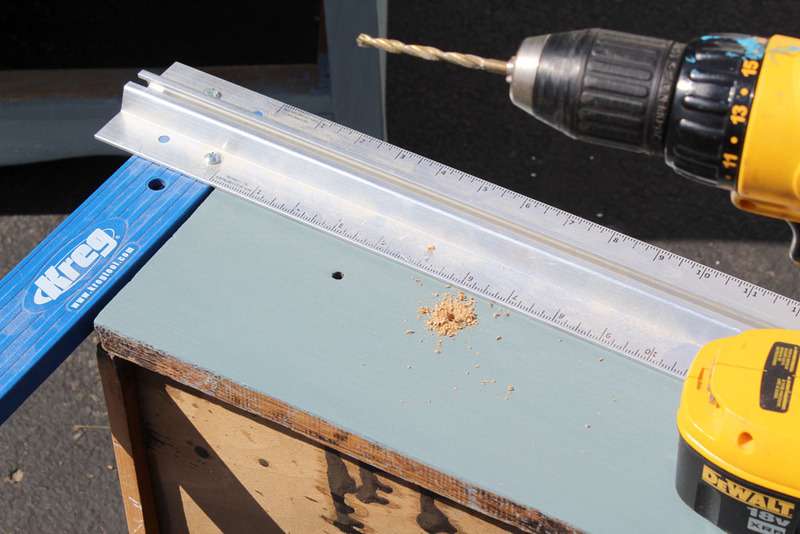 He drilled new holes parallel to the ruler, offset by 2.5″ from the old holes (the spacing required for the new handles). Excited to see the refinished dresser with the new hardware, I laughed when I saw that my husband installed all the half moon drawer pulls upside down haha! (see below). After having a quick chuckle, I easily flipped the half moon drawer pulls. It was just a quick fix to flip them, and voila! The refinished dresser was done. I finished the piece just as the sun was setting and was anxious to move it inside. Once inside, I quickly adorned it with some of my favorite decor, including the below picture of my late grandmother. So fitting too because she was a DIYer back before the term ever existed. A flea market fanatic decades before all of the network shows. Boy, she would have loved to have known about milk paint. 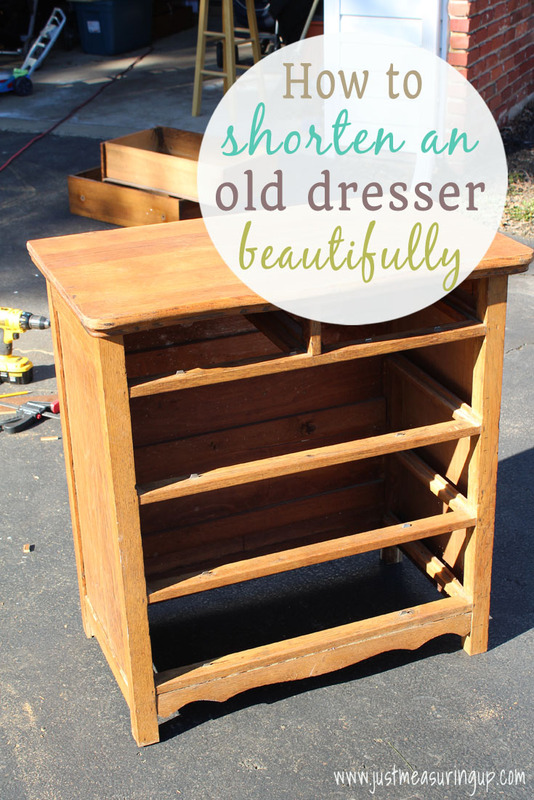 Overall, I was so thrilled with how the refinished dresser looked in our home. It was truly quite a makeover. 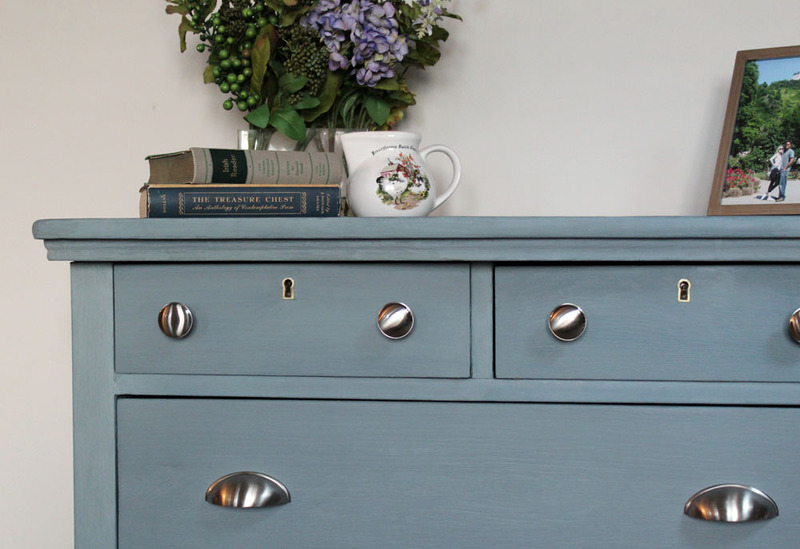 If you are looking to transform an old piece of furniture or if you are just looking for a non-toxic, child-friendly, pet-friendly safe paint, definitely check out The Real Milk Paint Company. They offer tons of colors (and you can mix even more yourself), the paint is easy to work with, your painting projects and possibilities are endless, and most importantly, the paint is safe.